This December I was invited to Spain to attend my new company’s Christmas party. It was held in a small town in the hills of Castile and León, known for its connections with the Spanish royal family. 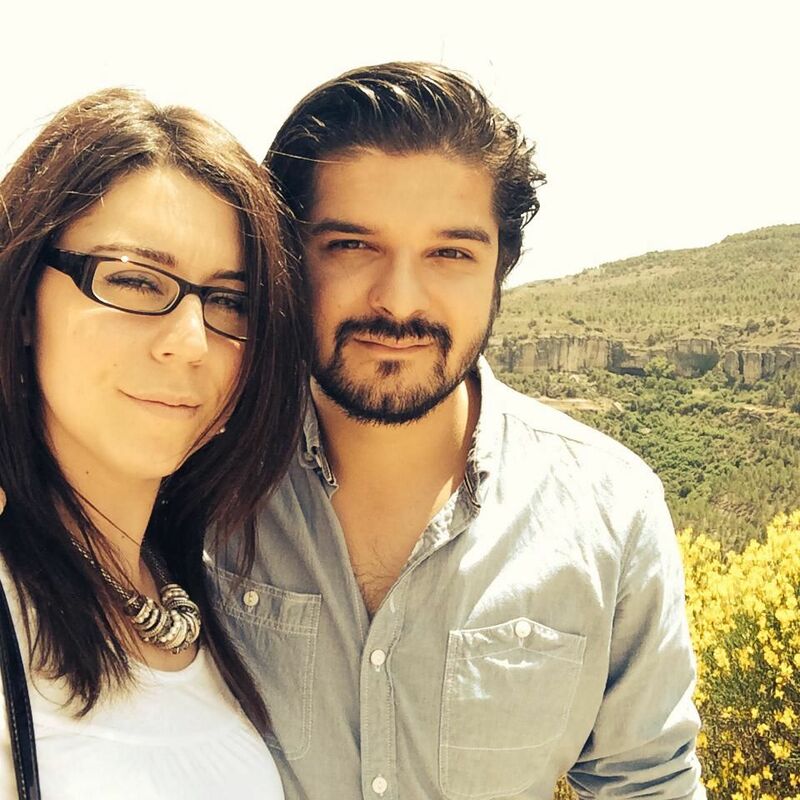 I spent four days working in their office in Madrid before we were bussed north to La Granja where we enjoyed dinner and drinks followed by a traditional lunch of cochinillo (suckling pig) the next day. 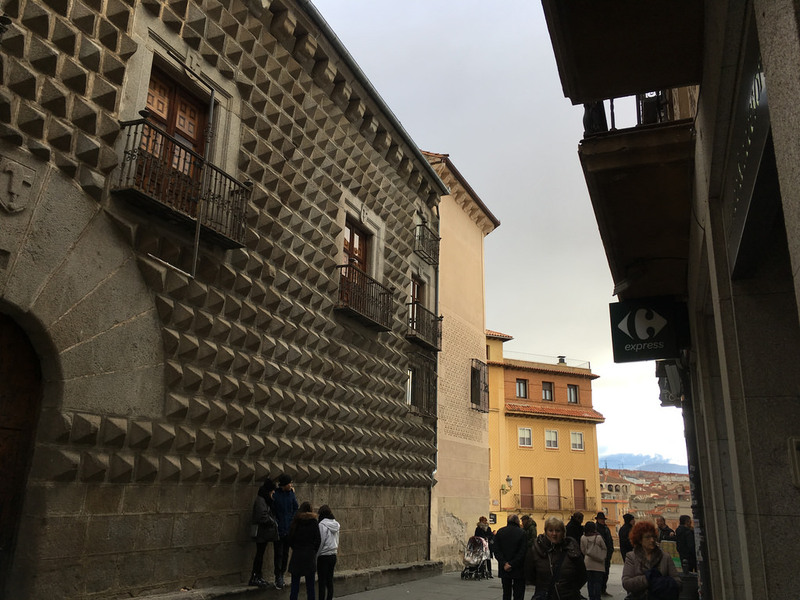 Knowing that La Granja – which features a Baroque palace with gardens modelled on Versailles – is just a few miles from the World Heritage city of Segovia, I delayed my return home by a day to give myself time for a visit. 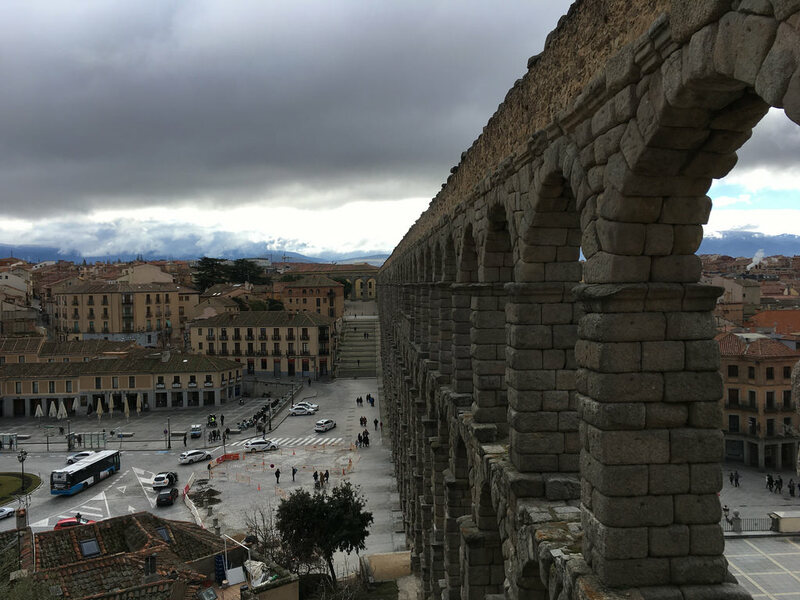 I arrived in the evening by taxi and checked in to my hotel to find the view from my room was both festive and historic – being situated very close to both the city’s famous aqueduct and a temporary giant bauble. The aqueduct was built by the Romans and was the highlight of my visit. It is, with Pont du Gard in France, one of the two best-preserved Roman aqueducts in existence and spans a remarkable 813 metres at a height of 28 metres. It is quite incredible to look up at the 20,000 granite blocks and to realise that it is not held together by any sort of mortar or cement. Using the principles of the arch – as discovered by the Romans – it is gravity that holds the structure together, with the blocks pressing in on themselves. The aqueduct remained in use until the 19th century. It was a quiet, cold Sunday morning as I walked uphill from the hotel into the city’s medieval streets. Interesting buildings abound, such as this one covered with spikes that were – according to the sign – meant to be part of some sort of defensive system. After some coffee and a couple of apple pastries I continued to the main square, where I found the city’s 16th century cathedral. An impressive sight, it was one of the last to be built in the Gothic style (at a time when the Renaissance had begun to take hold elsewhere). I went inside and saw that the only way to get up the tower was to take a guided tour – of which there were only three a day and the first was about to start. So, not realising that it would be conducted entirely in Spanish, I signed up and spent a full 90 minutes walking up spiral staircases and not really understanding what was going on. There was at least a video that had English subtitles, so I was able to glean that the tower is taller than that of Toledo Cathedral and that a fire caused by lightning destroyed its spire not long after its completion. With eight World Heritage Sites the ‘autonomous community’ (bureaucratic speak for province) of Castile and León lays claim to having more than any other subnational region in the world. Tuscany and Lombardy – both strong contenders – each have six. Update: Tuscany now has 8 and Lombardy 10, so Castile and León are no longer world record holders – thanks to reader Thomas for pointing that out! Leaving Segovia for Madrid I bought a ticket on the slow train which wound its way through the mountains for two hours. After failing to make my way through the world’s most confusing train station (the unsigned labyrinth of Chamartín) I gave up and took a taxi to the airport for my flight home. This gave me a chance to reflect on my World Heritage Site travels of 2017. Whilst not a record year (that was 2015), I managed to visit 15 sites in 9 countries – all but one of which were in Europe. 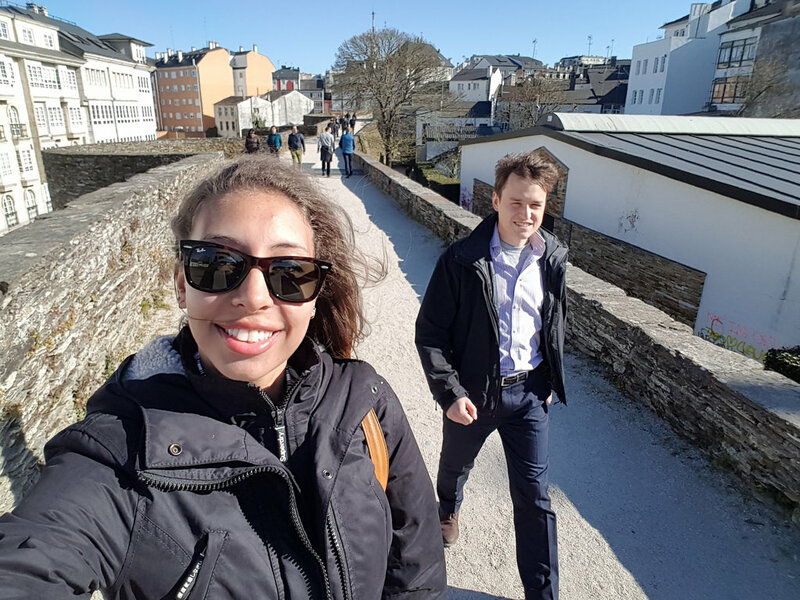 My companions included Natalie (9), Nowell and Ross (2 each), plus various university and business school friends in Riga and the Lebanon. Of the sites, my favourite was probably the Vatican City, followed by either Rome or the Norwegian Fjords. The city of Le Havre deserves a mention, too, for surprising to the upside. The count now stands at 118 – Merry Christmas and let’s see what 2018 will bring! This entry was posted in 2017, Spain and tagged history, Spain, travel, UNESCO, world heritage site on 25 December, 2017 by Tom Livesey. Toledo was the last WHS of my Portugal/Spain trip in December 2016. 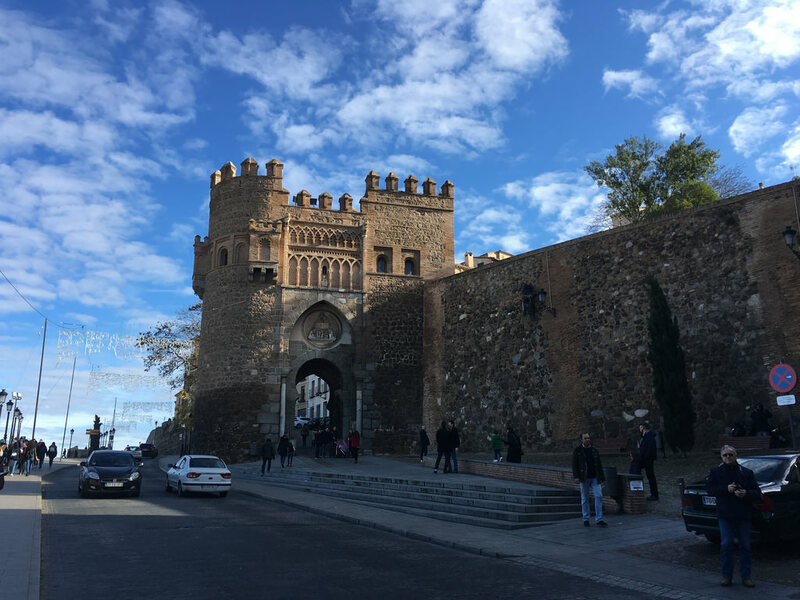 After touring Alcalá de Henares on my own I met Natalie at Madrid’s airport and the next morning we caught a coach from Spain’s current capital to its former one. 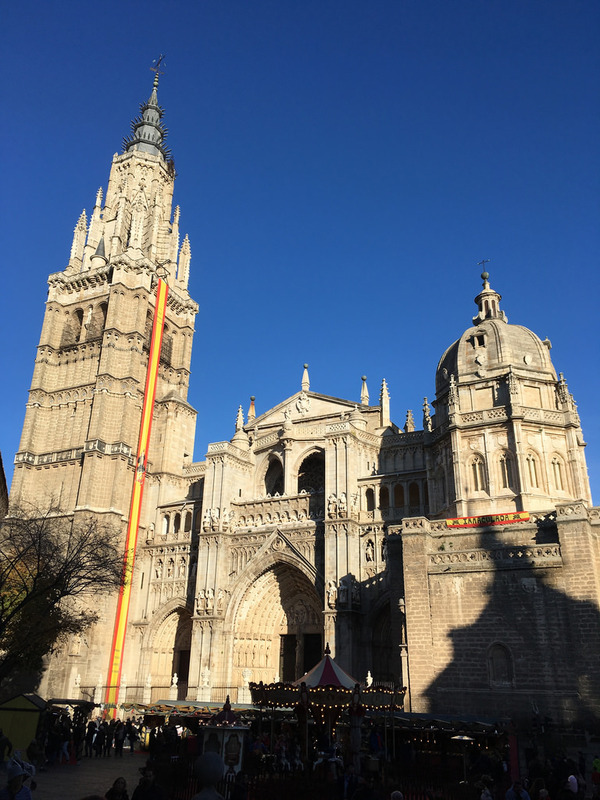 Toledo is a hilltop medieval city that bears witness (as so often in Iberian World Heritage Sites) to the meeting of cultures – successively the Romans, Visigoths, Moors and Christians, with Jews also present pretty much throughout. 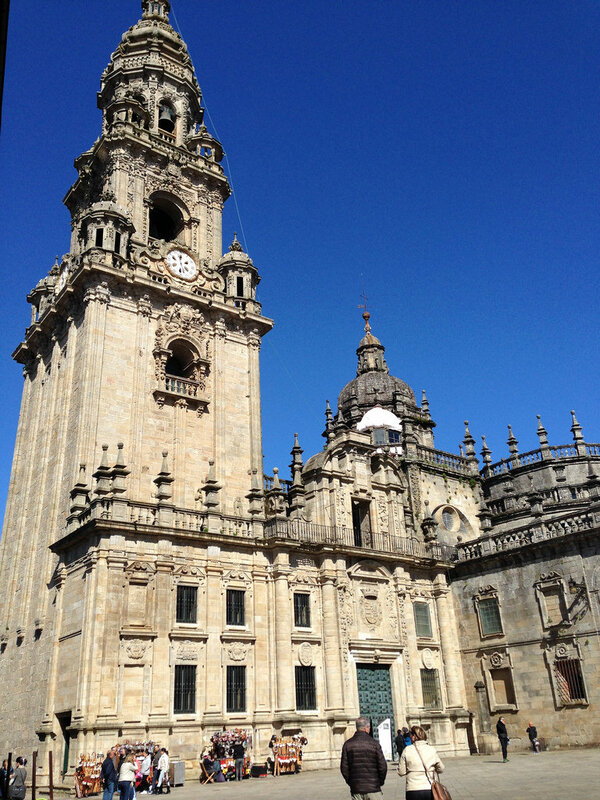 The city’s cathedral, above, was for a long time the centre of Spanish Catholicism. As the Protestant Reformation swept Europe in the 16th century the Catholic authorities sought to retain believers by commissioning artists to paint vivid scenes from the life of Christ. One of the most famous of those artists today was the travelling Greek painter known as El Greco. He lived in Toledo for 38 years and left a legacy of paintings that justify a visit on their own. El Greco is known for his use of shimmering bold colours that seem to burst out of the canvas, combining elements of Byzantine art with Western painting. 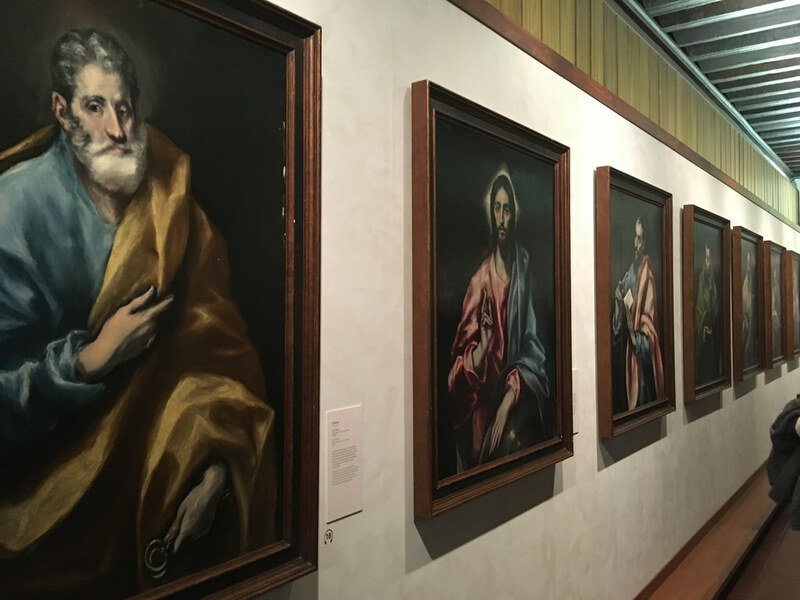 In the El Greco museum there is a collection of Jesus and the 12 Apostles which I found really impressive. Toledo is defended on three sides by the Tajo river, much as Durham is by the Wear. We reached our hotel from the bus station by walking up the hill’s steep approach and then went out for lunch. Here follows a top tip: if you ever visit Toledo and enjoy informal but excellent dining, go to the newly-opened Mercado de San Agustín. It is a five-storey food court where you can choose from a range of options and get some really delicious tapas-style Spanish food. We enjoyed it so much we ate there twice. It was similar to the Time Out Market in Lisbon, where we had a great time in March 2015. 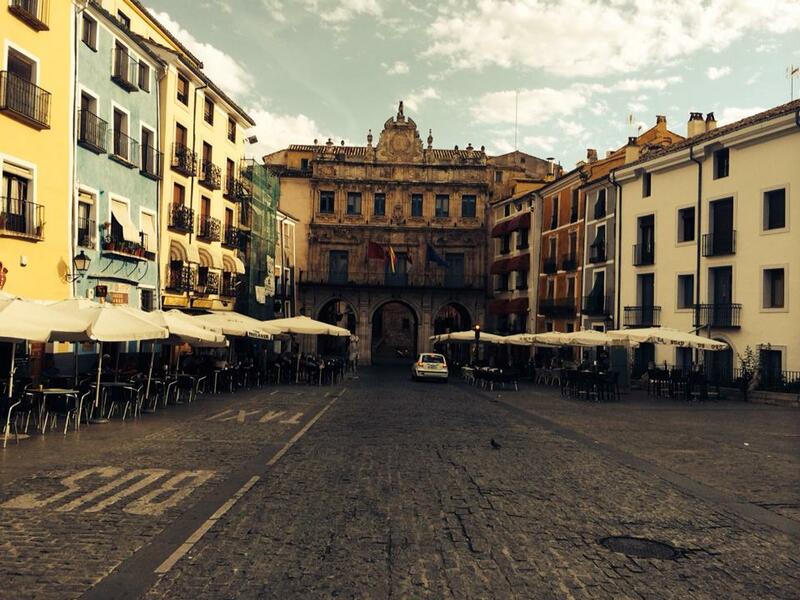 Toledo is a maze of narrow alleyways – like Venice without the canals. Local vendors play on the city’s medieval past of course, meaning disconcertingly many shops are packed to the gunwales with swords and daggers for sale. On Sunday morning the weather had changed from the blue skies in the picture of the cathedral, above, to a total white-out caused by thick fog. We set off for a walk to the Jewish quarter and the city’s other cathedral. Natalie and I realised then that neither of us had ever been in a synagogue. We have been in plenty of churches and the occasional mosque (in my case only in Istanbul), but never a Jewish place of worship. So we took the opportunity to have a look around a former synagogue that is no longer in use here in Toledo. I liked all the columns and the gold, but it did lack some atmosphere due its not being in active use. Hopefully we’ll get to see a working synagogue eventually. And that was really the end of the visit. We caught our coach back to Madrid and then the Metro to Barajas airport. My 10 day trip to Portugal and Spain that had begun with the laurel forests of Madeira had come to an end, with a respectable 8 World Heritage Sites visited. I only have a few more to visit in Portugal (in the north and in the Azores), but plenty left to do in Spain, which is a real gold mine. This trip saw me cross the 100 mark (I think that was at the Monastery of Batalha in Portugal), putting my total after Toledo at 104. With 1,052 in the world at the time of writing, that’s just another 948 to go! This entry was posted in 2016, Spain and tagged art, food, history, religion, Spain, travel, UNESCO, world heritage site on 27 January, 2017 by Tom Livesey. Natalie and I arrived from Santiago de Compostela in Lugo by coach, where I was surprised by the size of the hill it was built on. Lugo is a small city of about a hundred thousand people, most of them living outside of its famous walls. It isn’t much to look at in the outskirts, but when we walked out of the bus station we found ourselves right next to one of the main Roman gates. Lugo was founded by the Romans under Emperor Augustus in the first century AD. The walls stretch 2 km in a circle and are 10 metres high. Originally reinforced with 84 watchtowers, they comprise one of the best-preserved Roman fortifications in existence today. The walls were kept in use by their builders for a century and a half, but following the fall of the Roman Empire they continued to be utilised by successive rulers of the city. These included the Germanic Suebi and Visigoths. 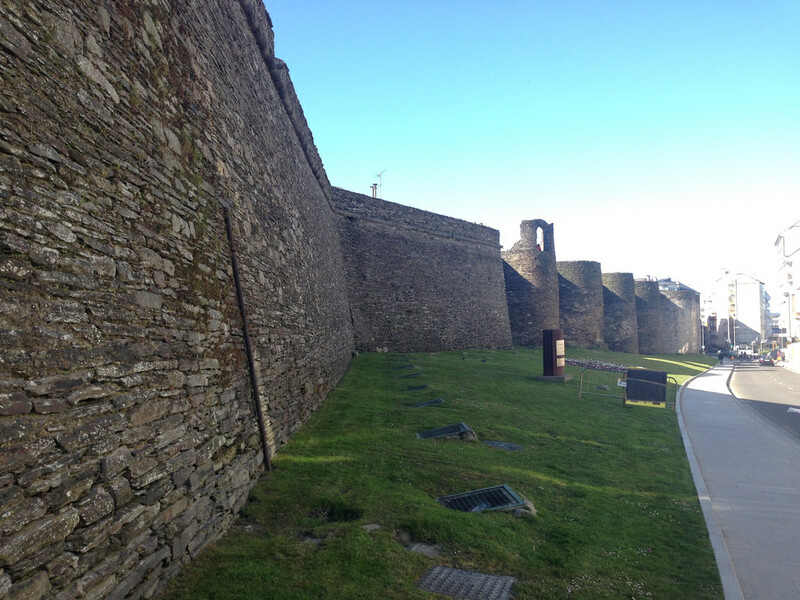 Like the walls of Dubrovnik, the wall at Lugo is still a public space and it is free to walk on them. We walked most of the way round in the early evening sunlight of an uncharacteristically cloudless Galician sky. This contrasted greatly with the dense fog that accompanied our visit to that most famous of Roman fortifications – Hadrian’s Wall – back in October last year. Lugo’s walls are in better shape than Hadrian’s, but that is more than can be said for some of Lugo’s buildings: both within and without there are numerous dilapidated old houses and industrial units covered with graffiti. Rather like Matera in southern Italy, it felt like a place that could do with some government money to give the historic features more dignity. Inside the walls the most notable building is the grand Gothic (amongst a hodgepodge of other styles) Cathedral of Santa María. 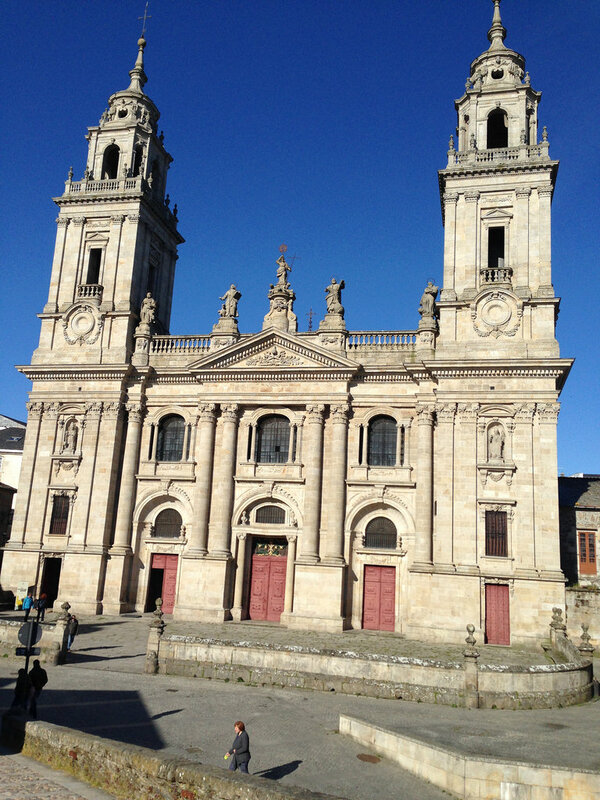 Lugo became the seat of a bishopric in the fifth century, and the first church on the site of the present-day cathedral was built in 755. We exited the wall when we got to the cathedral in order to enter the its dimly-lit interior. I found it rather underwhelming to begin with, but the darkness was soon pierced by the brilliant silver of the altarpiece in the choir. The ceiling paintings above were much to my taste, as I have also found at Würzburg, Florence and Brühl. 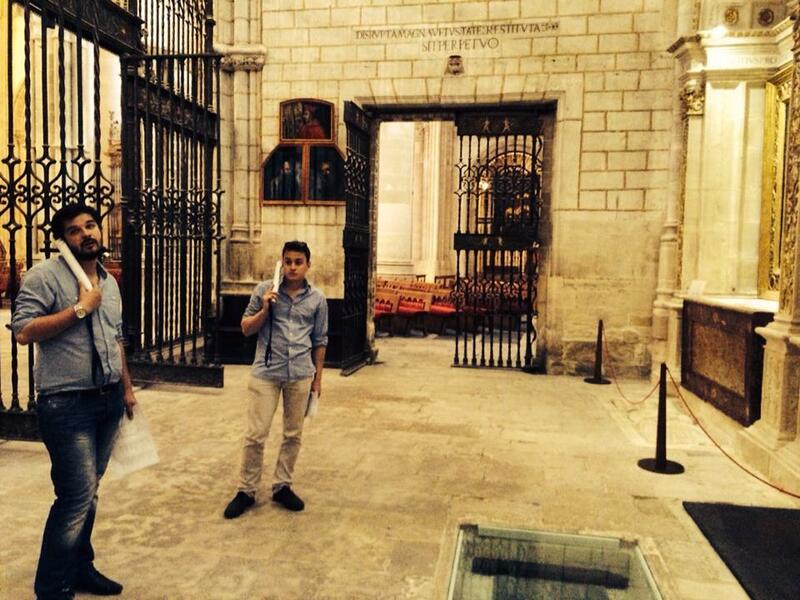 Although not a World Heritage Site, the cathedral is on Spain’s cultural heritage register. We spent a night in a hotel just outside the city walls and dined within them at a downmarket bar. The food was fairly disappointing, but we had been unable to find any proper restaurants open at the hour we wanted to eat. The Spanish, of course, like to take their meals far later than we English are used to. The next morning it was back to the coach station for the final leg of our weekend tour, which was to be another two hour journey. This time we were headed north-west, to the coast, and to the Roman lighthouse at La Coruña known as the Tower of Hercules. This entry was posted in 2016, Spain and tagged europe, romans, Spain, UNESCO, world heritage site on 20 May, 2016 by Tom Livesey. The weekend straddling April and May 2016 was the first bank holiday weekend of the summer season. I often take advantage of the chance to go away for three days without taking any time off work and this time around I chose Galicia, in north-west Spain. 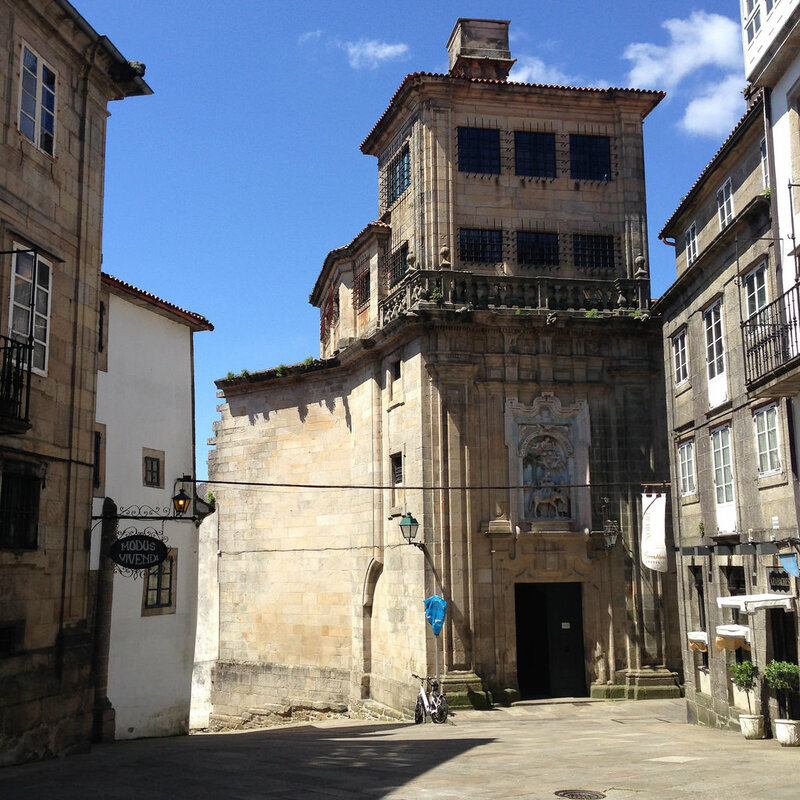 There are three World Heritage Sites that happen to form a triangle in Galicia, each site about 50 miles apart. 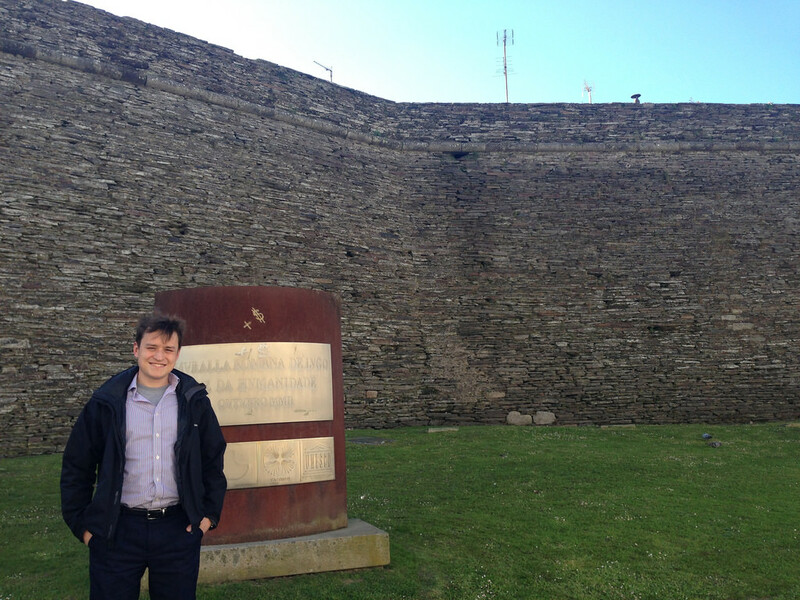 These are the Roman Walls of Lugo, the Tower of Hercules in La Coruña and our first destination, the old town of Santiago de Compostela. Although Natalie lives near Heathrow (and I live in Bristol) we have found that every trip we have planned from now onwards ended up being out of Gatwick. The flight to Santiago departed at the ungodly time of 6.30am, so we stayed the night before in an airport hotel. It was a clear morning when we departed, giving a clear view of Southampton and the Isle of Wight from 20,000 feet. and finally as the disparate set of routes and churches that supported the pilgrims in France (which I have been to a few parts of but have much yet still to see). The symbol of the pilgrimage is the clamshell. Seeing it on a signpost lets pilgrims know that they are on the right route, and if a building displays it that means it welcomes pilgrims to shelter (eg. in churches or private houses). Pilgrims carry clamshells about their person, often mounted on a special wide-brimmed hat. We saw quite a few of them on our trip, including a couple on the flight (skipping the hard part, I thought!) but also many pacing along the roads between Santiago and Lugo. Britain is a source of pilgrims – one of the ways it used to be done was to walk through Cornwall to St Michael’s Mount near Penzance and then take a boat across the Channel to Mont St Michel in Brittany before continuing the journey on foot to Spain. My parents’ house is on the route itself, so we are well used to seeing the clamshell on our Cornish walks. 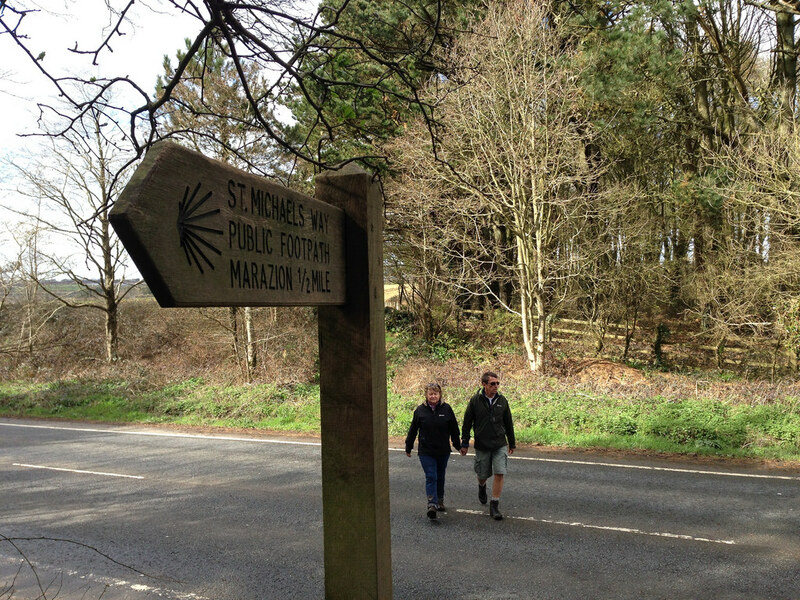 At Easter this year we walked a section of the Cornish route (where it is known as St Michael’s Way) – as you can see from the signpost below. Upon arriving at Santiago’s Lavacolla airport we rode a bus to the city. The centre point is naturally the cathedral, which is a grand Gothic building very much in the Spanish style. It was a beautiful bright day, but windy, meaning it was still overall not very warm. They had a no-bag rule in the cathedral (because of the number of backpackers who turn up there) so Natalie and I took turns to go inside whilst the other watched the bags. The interior features much gold and finery within the nave and choir. 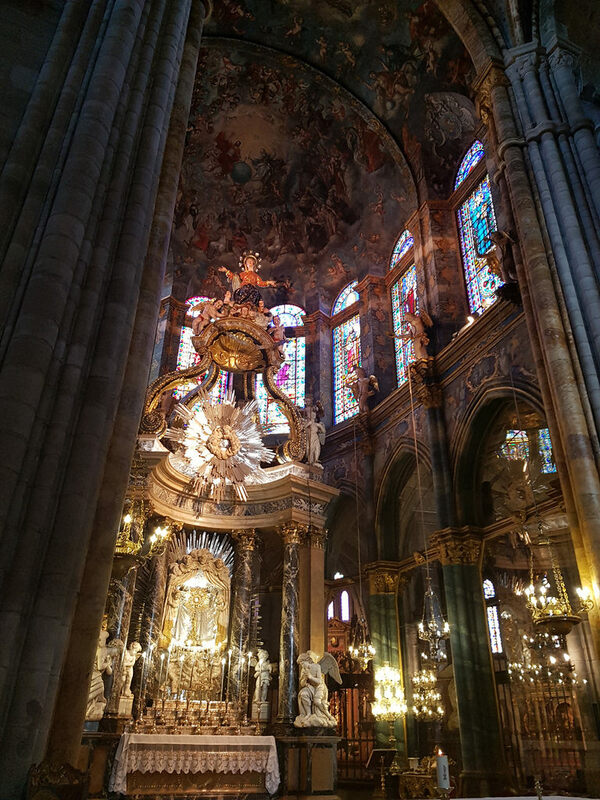 The altar, below, is of course the focal point, and within it is a statue of Christ which pilgrims and regular visitors alike queue up to touch. The pilgrims also wish to touch the left foot of a statue of St James, which signifies that they have finally reached their destination. The stereoscopic effect on the floor of one of the chapels put me in mind of the Silk Market in Valencia. 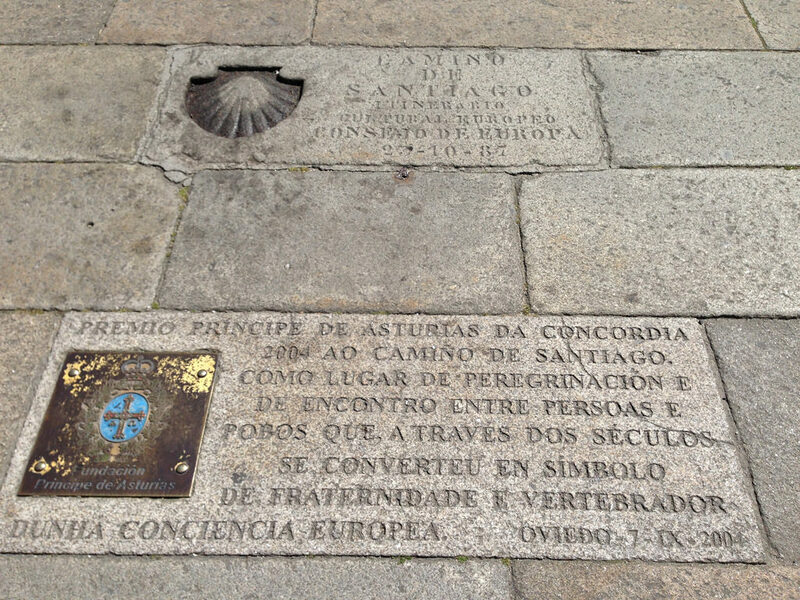 The medieval streets of Santiago de Compostela date from the tenth century, when they were rebuilt after having been destroyed by the Muslim invaders of the Iberian peninsular. It is said that the discovery of the remains of St James in Santiago around that time gave the Christians the motivation to push the invaders out over the following centuries. 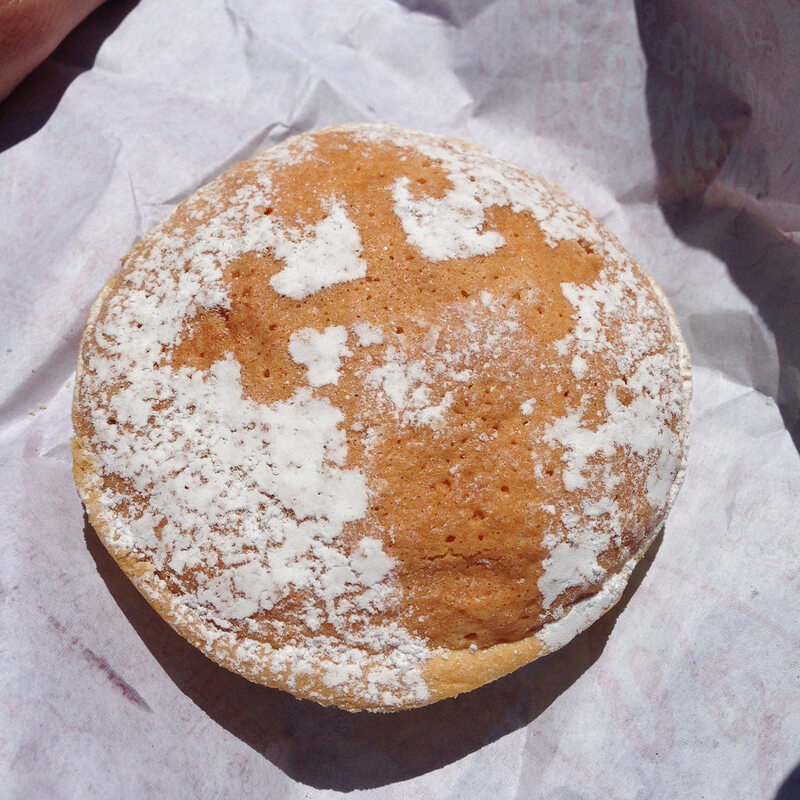 There is a local almond cake that holds EU protected geographical indication status, known as a Tarta de Santiago. Although this one has been knocked slightly askew, you can make out the cross of the Order of Santiago in icing sugar. 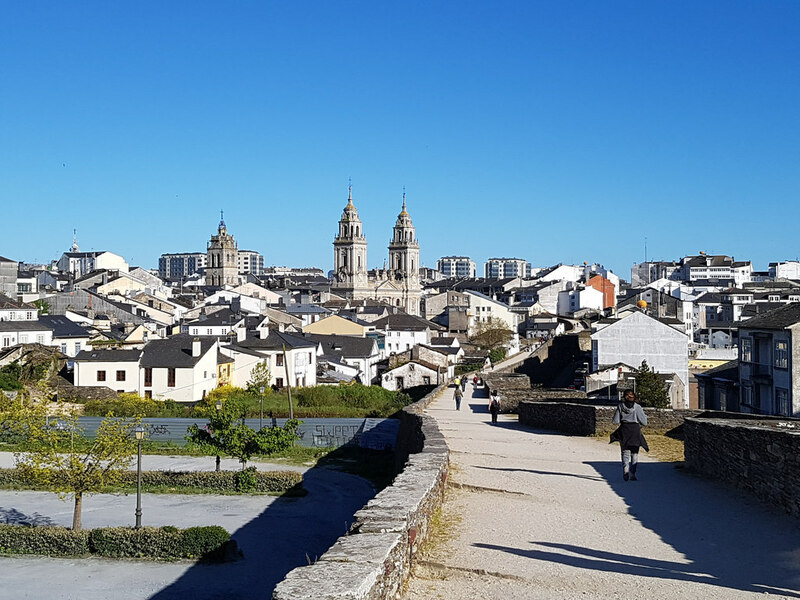 We spent a few hours in Santiago before catching a coach to our next destination: the relatively remote city of Lugo, two hours to the east. This was the first time we had travelled long distance by coach, and I was relieved to find that Natalie didn’t hate it as much as she had feared! 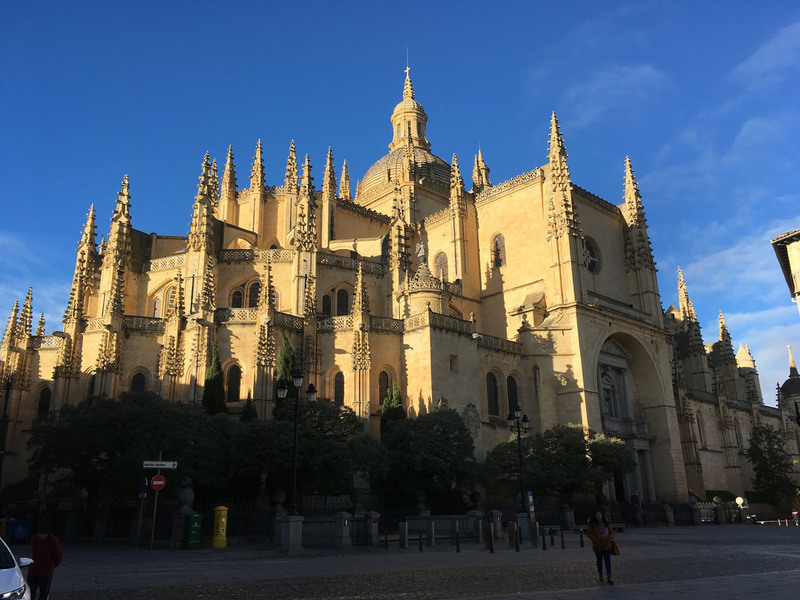 This entry was posted in 2016, Spain and tagged christianity, islam, pilgrimage, Spain, travel, UNESCO, world heritage site on 18 May, 2016 by Tom Livesey. This spring Natalie and I have been fortunate enough to have lots of mini-trips coming one after the other. At the end of March we returned to Barcelona for just one night, after I saw an artichoke festival advertised for Sunday 29th March in a western suburb of the city named St Boi. We took a lunchtime flight out of Stansted to Barcelona’s El Prat Airport (much closer in than the distant but charming Girona we had stayed in back in November). We landed at 4pm, giving us just enough time to finish off the Gaudí WHS with a visit to the Casa Mila and Casa Vicens. We never managed to visit the faraway Crypt at Colonia Güell, but I’m calling this one finished with six of the seven subcomponents done. After sampling some French cheese and Spanish pears in our rather inconveniently-located hotel we ate a good meal of tapas at a nearby restaurant. 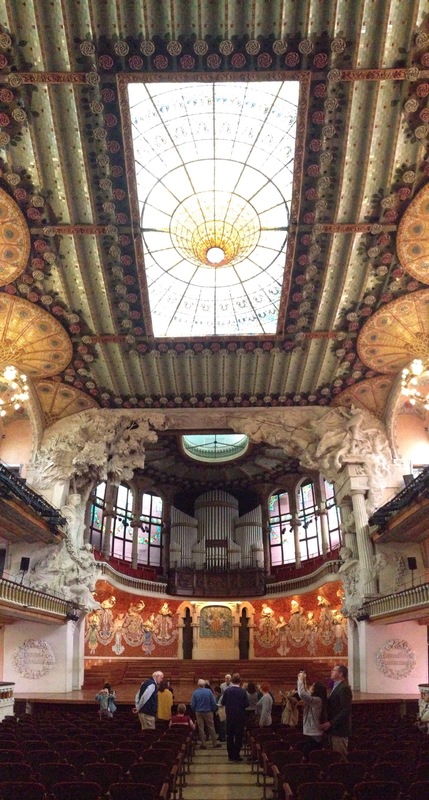 The next morning we were booked on a tour of the first of two subcomponents that make up this World Heritage Site: the Palau de la Música Catalana. 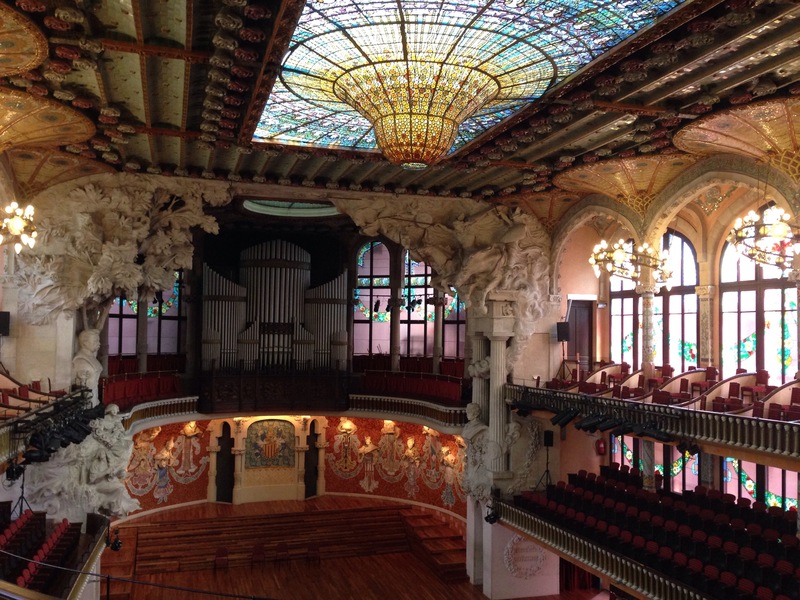 The link between this music hall and the other site – a hospital in the northeast of the city – is that they were both designed by the Catalan Modernist architect Lluís Domènech i Montaner. 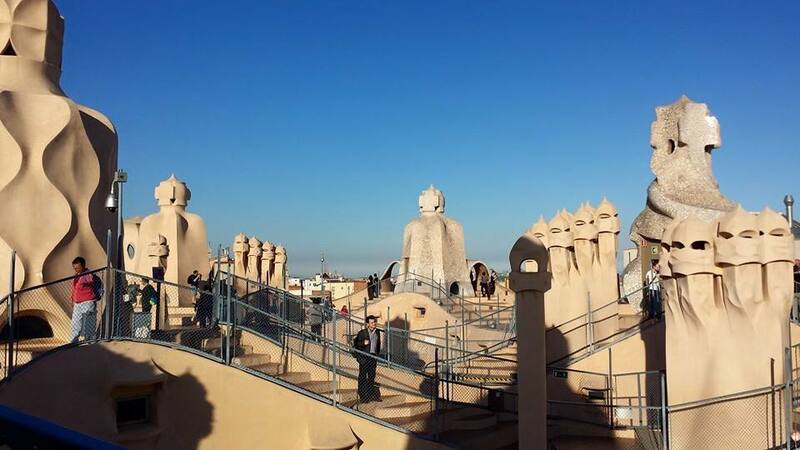 His work is often mistaken for that of his more famous Catalan contemporary Antoni Gaudí – and I can understand why – but it is important to remember him as his own man. There are only two ways you can get into the music hall – either buy a ticket to see a concert there or go on a guided tour. 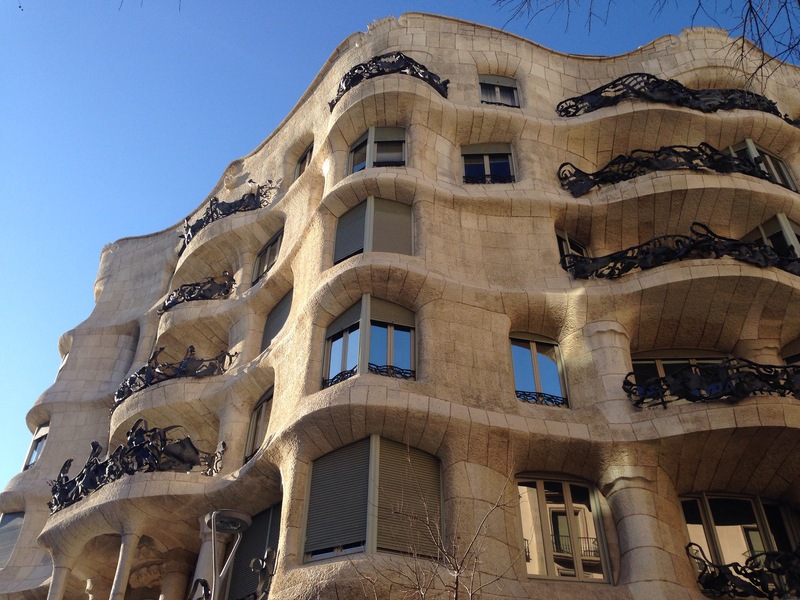 We opted for the latter option; at €18 it is cheaper than Gaudí’s Casa Mila and more interesting if you have already visited another of Gaudí’s buildings, such as the Casa Battló. There were only about 20 people on our tour, most of whom you can see in the vertical panorama above. The music hall was built between 1905 and 1908 on a hemmed-in plot of land that used to house a church. Being part of the Art Nouveau movement, the design of the building called for lots of ornamentation, curves, colour and light – properties which endear them to visitors today but which were not always in fashion. The statues of 18 muses, some of which you can see on the stage behind me, were used during the 1920s and 30s as mere coat hooks for musicians as they practiced for performances at more prestigious venues. Nowadays the music hall is very much back in favour, and plays host to over 300 concerts a year. Clearly the best time to visit must be a matinee performance, when you can benefit from the vast amount of natural light that floods into the hall through the side and rear windows and of course the magnificent skylight, nicknamed ‘the Glow worm’. Above you can clearly see the dramatic effect as it dips down into the auditorium, maximising the amount of light that could be garnered in the decidedly second-rate plot of land the architect had to work with. There is one obvious downside of having so much glass in a music hall, and that is the impact on the building’s acoustics. When it was fully occupied, the body mass of the 2,200 people sitting in the auditorium absorbed enough of the sound that resonated off the glass that no problems occurred. The hall is said to be particularly suited to the appreciation of higher-pitched instruments, such as the violin and the flute. However on nights that were not fully booked there would be a noticeably suboptimal acoustic environment. The Palau eventually abrogated this problem in the 1980s when they raised funds to install sound dampening surfaces on the underside of every seat in the house. Now, when a seat is unoccupied it is flipped up and the underside absorbs as much sound as a human body would if the seat were occupied, thus ensuring perfect acoustics at every performance. After an engrossing tour of the music hall we set off on the Metro for the second site of the day – the Hospital de Sant Pau. There is still a very modern working hospital here, which we accidentally went into before being directed round the corner to the Modernist original. The hospital, whose main building is shown in the title photo, has the feel of a small city. It consisted of something like 27 separate buildings, connected by underground service tunnels. It was built between 1902 and 1930 and takes up a large square space in which its own internal grid layout is at a striking 45° angle to the rest of Barcelona’s city streets. You can see plenty of Art Nouveau flourishes in the brightly coloured and ornate tiles, domes and mosaics that Domènech i Montaner used. It really is a pleasant place to be – in fact Natalie as much as said she would deliberately injure herself in order to be treated there, were it still a working hospital. In fact that was until recently quite feasible, since it was only withdrawn from service in 2009 – one year after being inscribed as a World Heritage Site along with the music hall. It was closed for renovation until 2014, making this one of the first opportunities the tourist has had to walk around. If you are wondering how the artichoke festival was, I’m afraid I was a little disappointed. It was so crowded, and the prices so low, that there were far more people than the stalls could handle – meaning massive queues for everything. When we did get some food I wasn’t overawed with the flavours (one egregious example was a cheese-stuffed artichoke on a stick covered in candy floss!). It turns out that I like artichokes best the simplest way you can buy them – floating in a jar of olive oil from a supermarket. 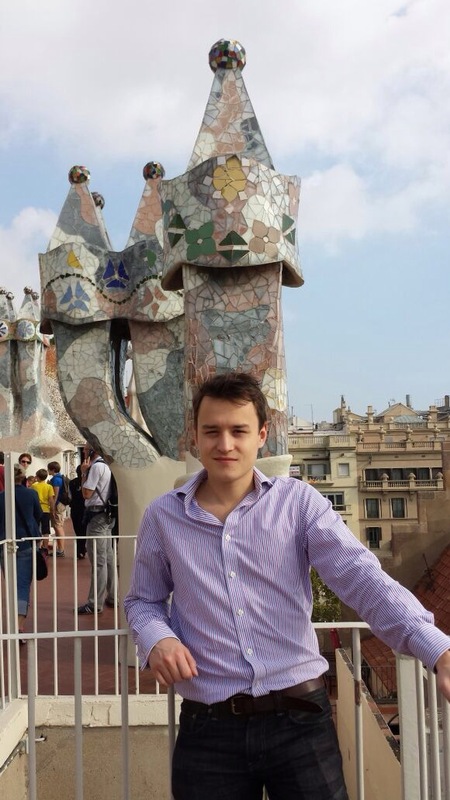 Nevertheless, we had a nice little trip and were glad to have been able to finish off the unfinished business with Gaudí as well as seeing a second dimension to Catalan Modernism and thereby completing the WHSs of Barcelona. 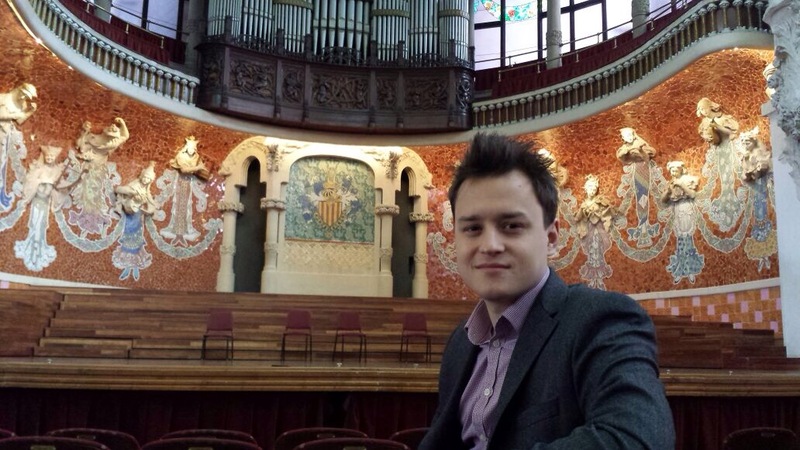 This entry was posted in 2015, Spain and tagged europe, natalie, Spain, Tom on 7 April, 2015 by Tom Livesey. With winter drawing in the appeal grows of seeking out the last vestiges of warmth in Europe. I figured the Costa Brava was as good a candidate as any, so booked a weekend trip to Girona, flying from Bristol. 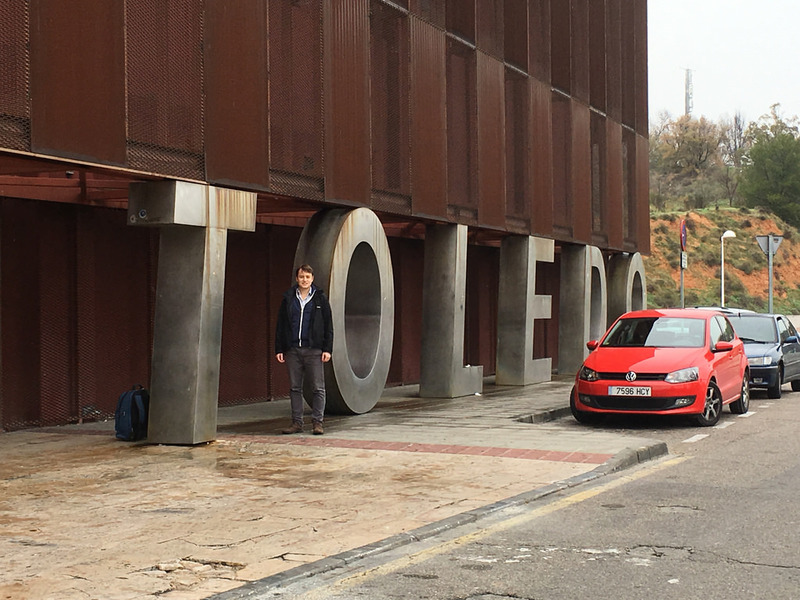 Although Natalie and I stayed in a hotel in Girona, we didn’t see much of the town as we used it as a base to visit two relatively nearby places of interest: Barcelona and Figueres. The weather was kind to us, and it was more like summer than late autumn. Ryanair has been a pretty reliable airline for us lately, and true to form we were rolling down the runway a full ten minutes prior to scheduled departure. On arrival we took a ruinously expensive taxi into Girona and checked into a pleasant hotel ASAP in order to get the customary arrival beer in before bed. Door to door the trip had been only around four hours – meaning I hadn’t had to take any time off work in order get there. On Saturday morning we got up fairly early and went to Girona railway station to catch a train to Barcelona (about 40 minutes journey time). The station, however, has a strict policy whereby they refuse to sell tickets for a train due to depart within the next ten minutes. For us this meant that instead of the 09:30 train we would have to wait for the 10:45. Given that we had only planned to spend the daytime in Barcelona before coming back to Girona for dinner, I was not too pleased about having my visit cut short by 75 minutes because the obstinate ticket vendor didn’t trust our ability to get to the platform in ten minutes! So I went to a machine, paid for our tickets on card, mentally cursing the ticket seller. As it turned out he had some justification for his rigid rule, because the platforms were quite a distance away…you had to go out of the concourse…along a corridor….down an escalator…through a security checkpoint…into another concourse…past a ticket inspector…down an escalator…and down another escalator to the platform. Natalie couldn’t get over how overbuilt the station was for the couple of trains per hour that pass through there (I told her it was a legacy of the credit-fuelled Spanish construction boom of the mid-noughties). Nevertheless, we managed to get there in time, so my comment is really that they should let people take their chances with the 10 minute window, perhaps with a caveat emptor, rather than having a blanket ban on all sales to able-bodied people. We soon arrived into Barclona Sants station and took the Metro to a place called Diagonal. Our first point of call was Gaudí’s Casa Battló – one of his most striking works (and also the most expensive to visit, at €21.50). 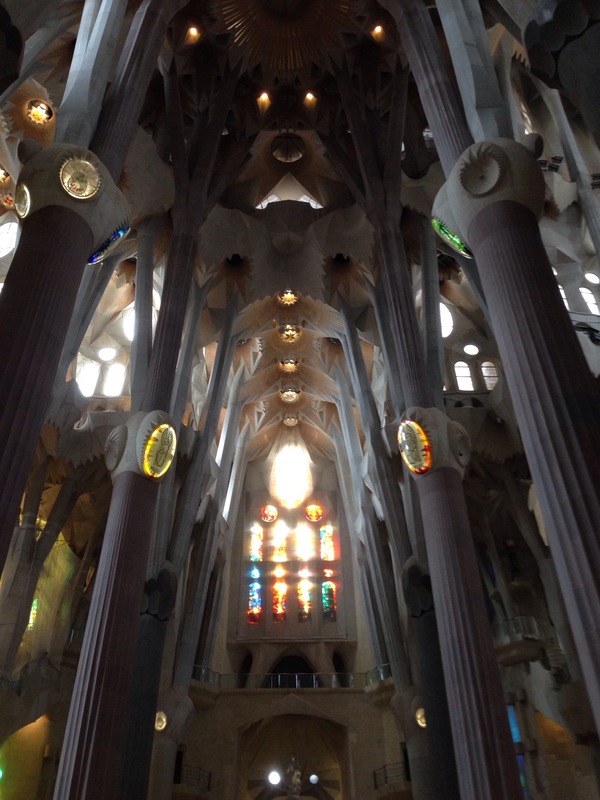 The building was not designed by Gaudí from scratch, but was heavily modified by him. Wealthy textile manufacturer Josep Battló i Casanovas, the owner, was fed up of his grand house being known as one of the most boring apartment blocks in the district. This was in 1901, when Gaudí was already famous, so Battló knew the man to call. The building is known for its avoidance of straight lines wherever possible; walking through its rooms and courtyards you see curves everywhere – just taking a stroll around the house makes you feel a little queasy. Aside from the front facade, which is evocative of a scaly undulating sea with birds nests for balconies, the other highlight is the roof, with its decorated chimneys. Gaudí was known for his desire to liberate humdrum functional items from mediocrity, which explains why he departed from the ordinary so overtly here. We didn’t visit the nearby Casa Mila because it is currently encased in scaffolding (as well as costing another €20). The scaffolding is tastefully covered in a wrap that shows an image of what the building looks like – but somebody has gone and put a giant advert over the top of it, rather ruining the effect. We walked next down La Rambla to the less famous Palau Güell. Like Park Güell, it was built for Gaudí’s most famous patron, Eusebi Güell. Güell was an industrialist and an extremely wealthy man. According to the in-house audio guide, he has been ranked by Forbes as among the top 20 richest people who ever lived, with a fortune of €75bn in today’s money. 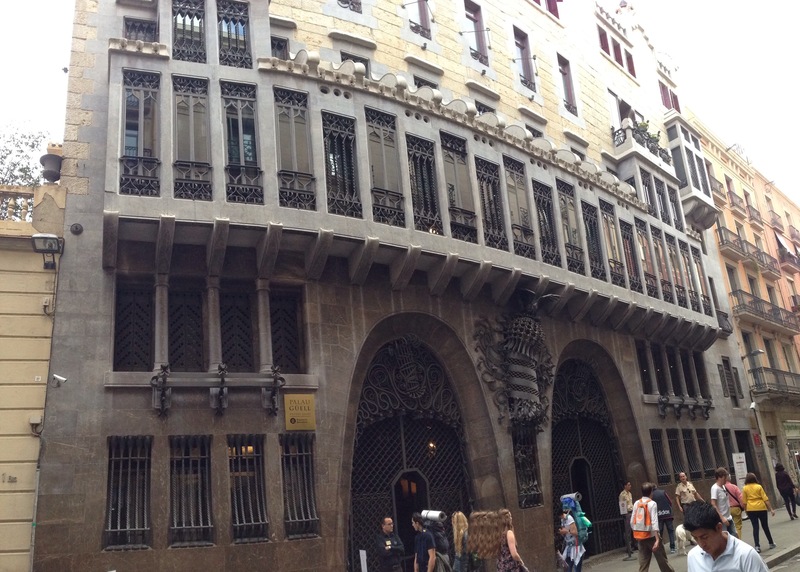 This building doesn’t immediately strike you as a Gaudí, given its more restrained appearance. Built largely in a dark marble, it is sumptuously decorated with ornate ceilings and stained glass windows. 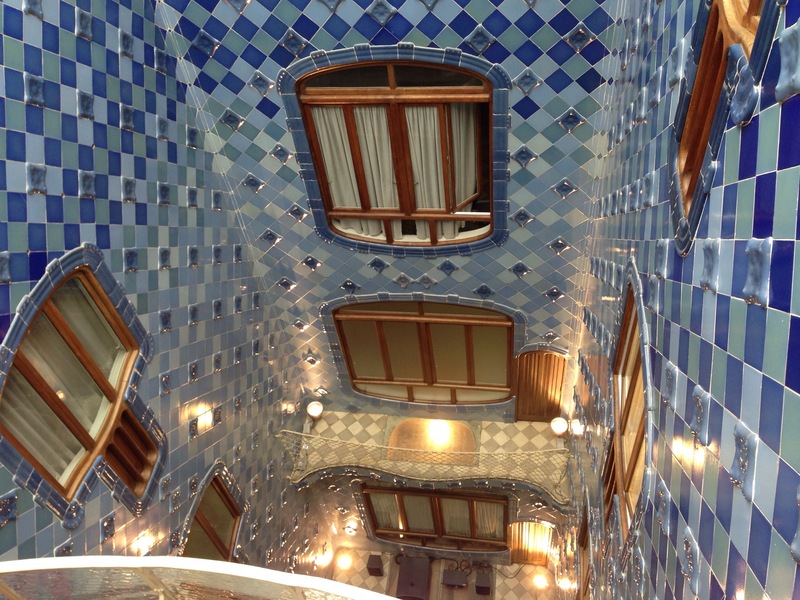 Unlike much of Gaudí’s other work, this building does not eschew straight lines and right angles. Palau Güell was Gaudí’s first major project, and represented to his patron an enormous gamble. Güell, like Gaudí, was a Catalan nationalist, and shared Gaudí’s political concerns for the working classes. But when they began their architect-client relationship, money ceased to be relevant. 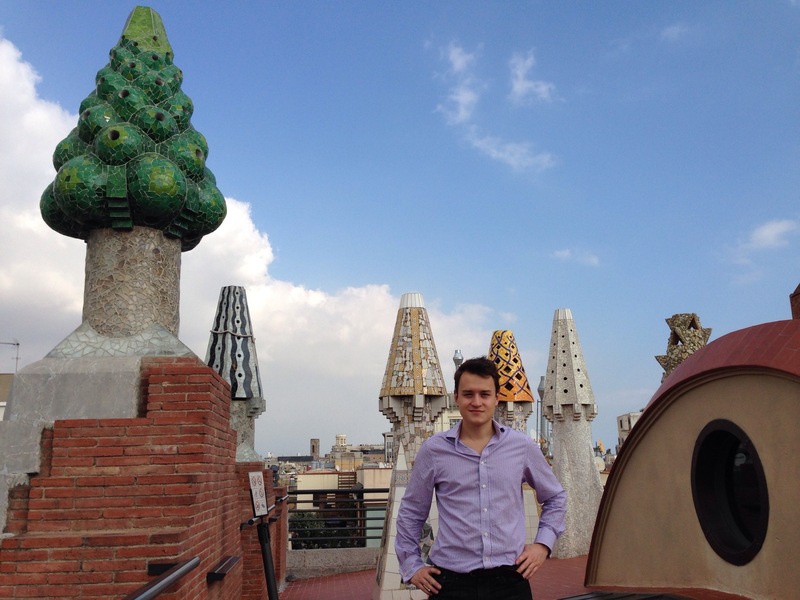 Güell’s accountant apparently lamented “I fill Don Eusebio’s pockets and Gaudí empties them”. But for the man who could afford anything, commissioning such a novel architect to build him a palace was a way of distinguishing himself from the other plutocrats of his day. 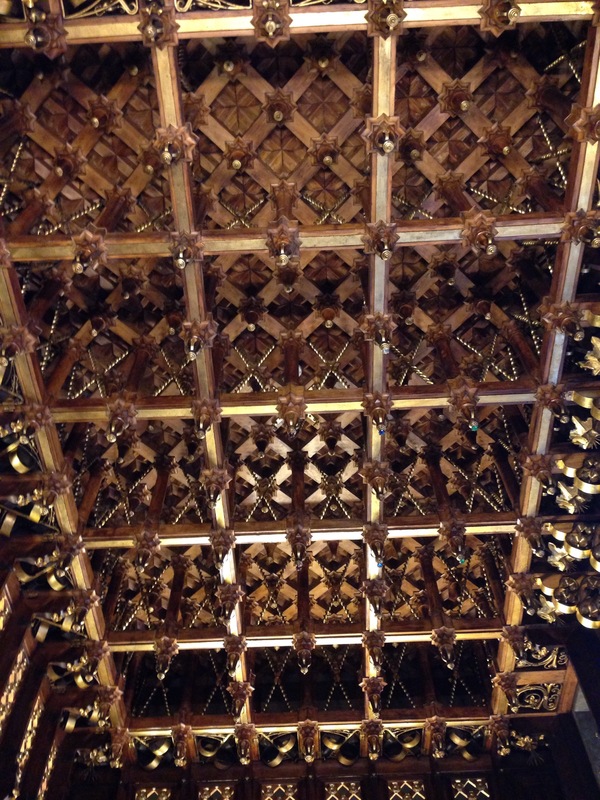 The picture above shows the ceiling of the three story inner hall, featuring a cupola filled with holes that let the light in so it resembles a starry sky. 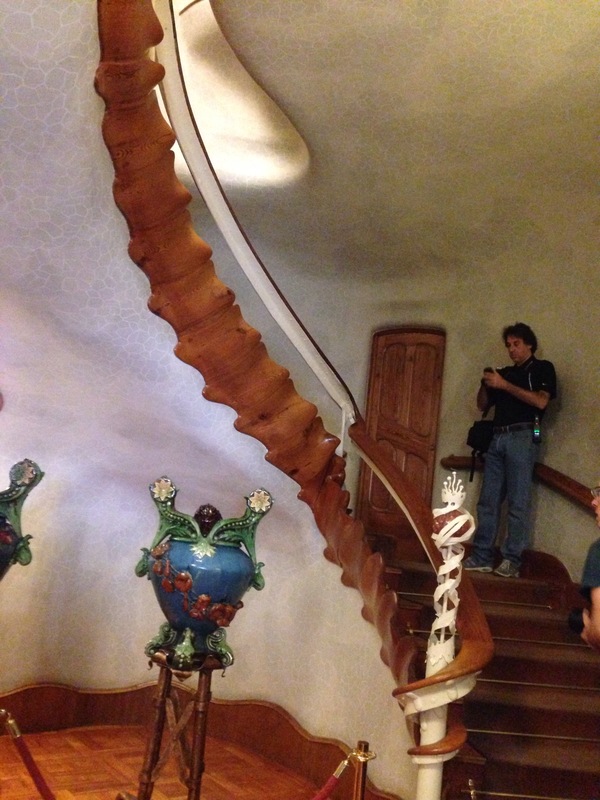 In this hall Gaudí placed an organ of his own design, which is still played to this day. All the other rooms in the house appear secondary to the central hall, which acts as the focal point around which the rest of the building converges. However that is not to say they are of inferior quality. 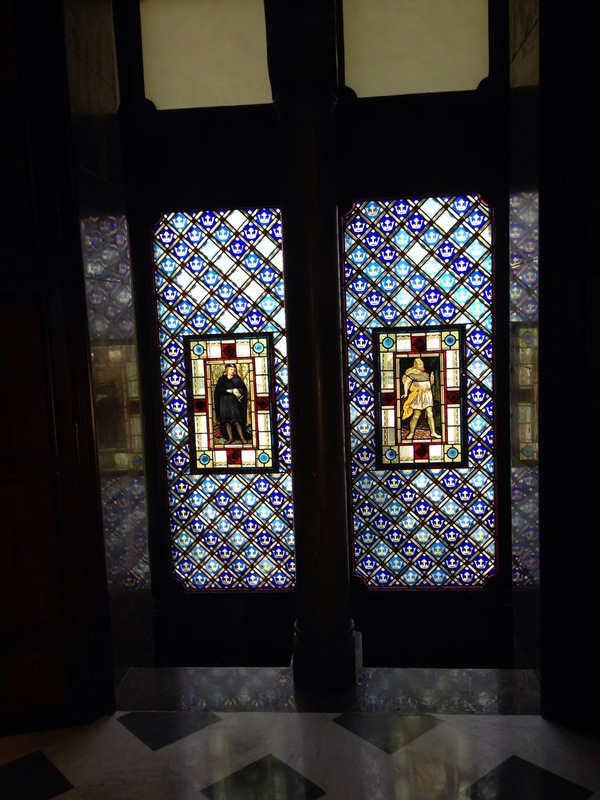 Below you can see the Shakespearean stained glass windows in the bedroom of Güell’s eldest daughter. The 18 colourful chimneypots and ventilation ducts on the roof of the palace cannot be seen from street level, but that doesn’t seem to have bothered Gaudí. Since the Güell Palace was finished in 1889 – some 17 years earlier than Casa Battló – this roof art can be considered a prefiguration of what was to come. 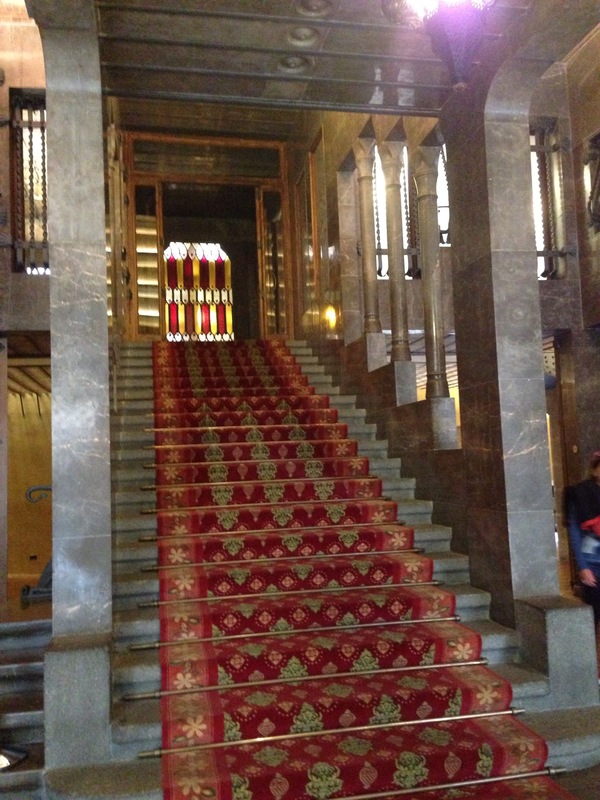 On finishing up at Palau Güell and exiting via the servants’ staircase we walked across the city toward Gaudí’s most famous work of all – La Sagrada Familia. Barcelona has the atmosphere of a relaxed and vibrant city, in which you can walk through tiny alleyways and emerge without warning onto open squares full of cafés. Its tall townhouses reminded me of the centre of Buenos Aires, although surely the inspiration ran the other way. I have visited the Sagrada before, about eight years ago on a school music tour. Then, the insides were full of scaffolding and I had no interest in architecture or churches – in fact all I remember about it is being quite bored. This time around, however, was a totally different experience. Up close, the sheer size of the building becomes apparent, and the ornate decoration on the outside of the building is a sight to behold. But it was upon stepping inside that the ‘wow factor’ really hit me – the interior looks to be pretty much complete now, and there is no scaffolding left. The sheer cavernous enormity of the space is something I have never experienced before. More so than most churches, the interior is full of colour. 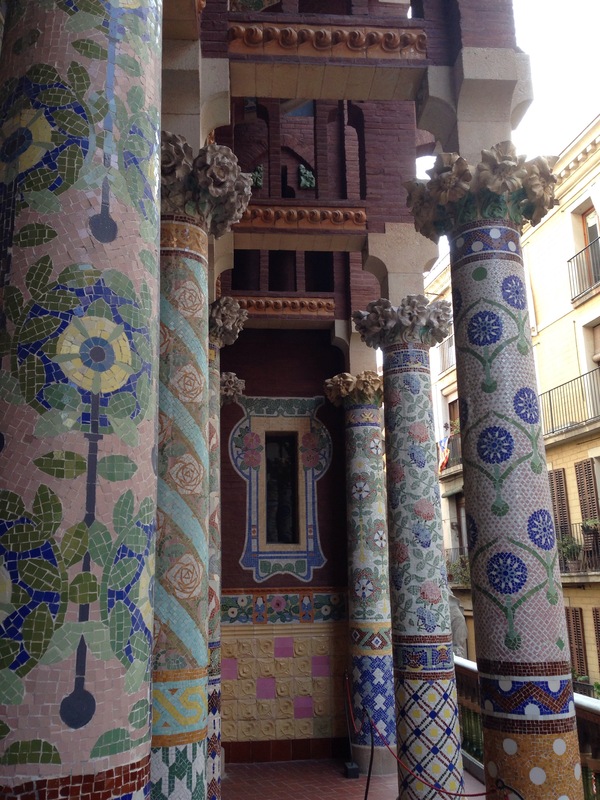 Gaudí designed the columns to resemble trees and branches. I am surprised to read on Wikipedia that there are numerous larger churches in the world, including some that I have visited – because this certainly felt like the largest to me. Perhaps that is a testament to the brilliance of Gaudí’s design. 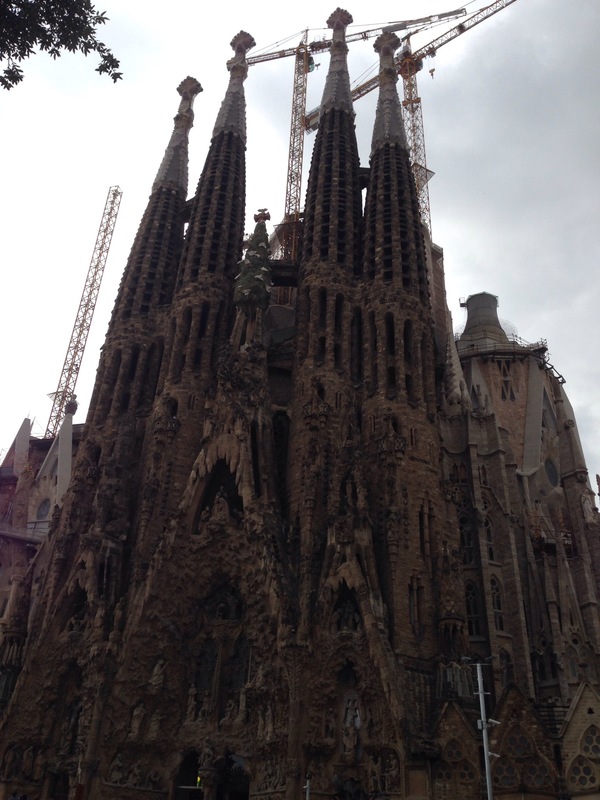 He started work on the Sagrada Familia in 1883 at the age of 31 and it consumed him for the rest of his life. Famously, today it is still unfinished, though a target date of 2026 is being talked about. One of the reasons the project has taken so much longer than anticipated (it had initially been expected to be complete before 1900) was because Gaudí preferred to evolve the design during construction, rather than rigidly to follow a set plan. The huge towers are topped with ‘crowns’ that resemble bishops’ mitres. Each tower is dedicated to one of the twelve apostles, who all became bishops – so it was Gaudí’s intention that the twelve towers of the Sagrada Familia would also appear to ‘become bishops’. The building was nowhere near completed when Gaudí died in 1926, and work has continued to this day. Given that he was one of the most celebrated residents of Barcelona at the time, presiding over its most important ever construction project, the story of his death comes as quite a surprise. When out walking one day in June he was hit by a tram. Although not killed outright he was severely injured. But because of his shyness (he rarely allowed himself to be photographed) he was wearing shabby clothes and people did not recognise his face, so he was mistaken for a beggar. Those who came to his aid found taxi drivers unwilling to take him to hospital, and when he was eventually brought to one he was not exactly rushed into the operating theatre. When the people of Barcelona found out who he really was it was too late and he was dead. Our final stop for the visit was at Park Güell, which is up a rather steep hill overlooking the city. There is in fact an outdoor escalator that you can take up to it. Unfortunately we only found this out on the way down. 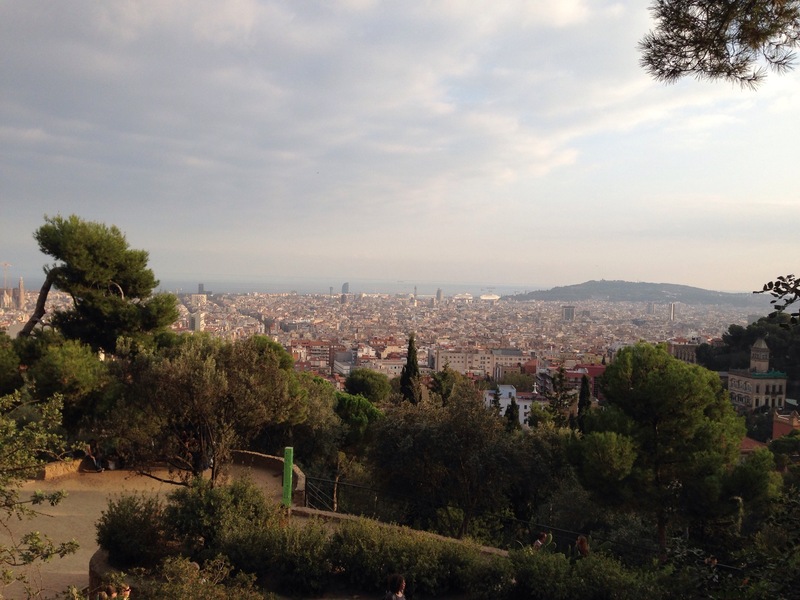 After labouring up to the top you are rewarded with an impressive view of Barcelona. The colourful mosaics adorning the walls of Park Güell are an immediately recognisable Gaudí trademark. They were not built using the expensive materials of the Güell Palace, though, but consist of scrap fragments of broken tilework that were discarded by tilemaking factories. A key aspect to the design of the park was Gaudí’s decision to follow the contours of the steep hillside on which it was sited. So instead of levelling the land he built raised walkways and cut tunnels for paths. The open area you can see above (which Gaudí called ‘the Greek theatre’) is completely flat and thus collects rainwater very quickly, so without adequate drainage would be at risk of collapse. The solution was both to make the surface porous and to make the Doric columns that support it hollow, allowing water to flow down through them. At the end of a long day of sightseeing we headed back to Girona. 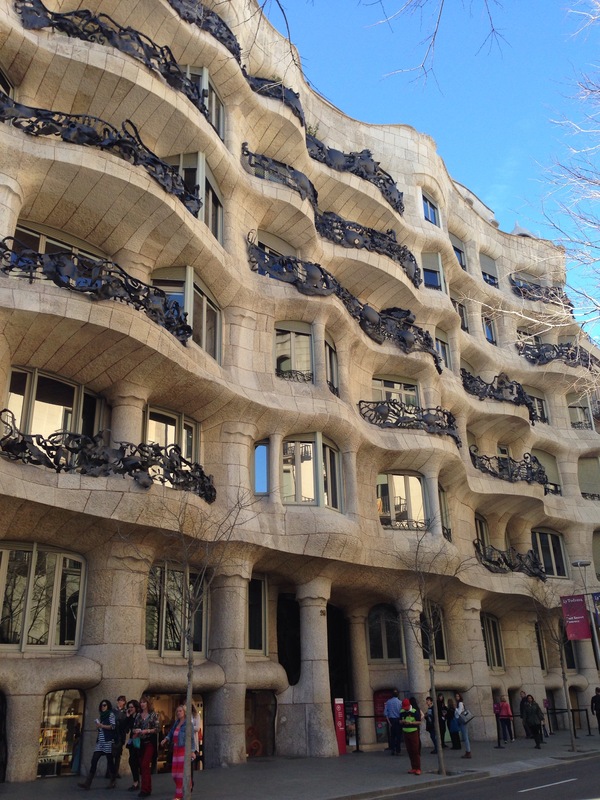 Of the seven inscribed properties that make up the Works of Antoni Gaudí World Heritage Site, we saw four. 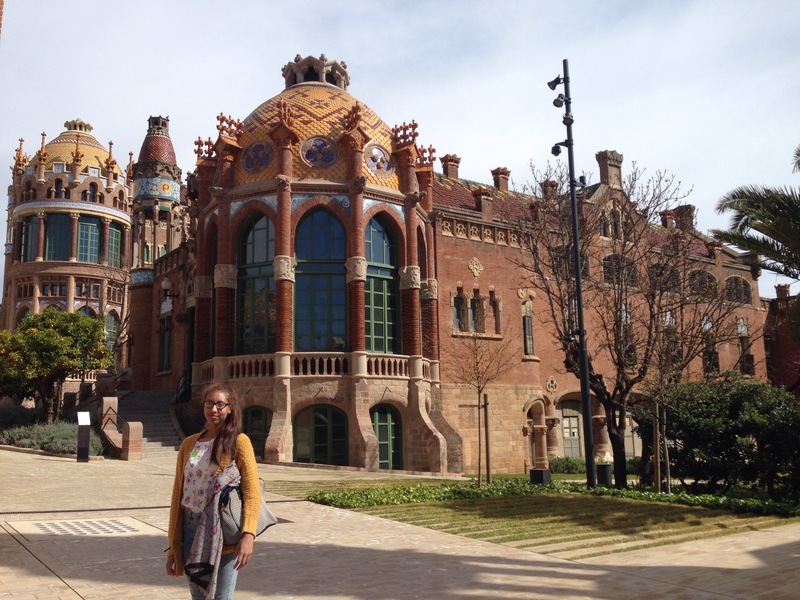 Of those we didn’t see, one was the Casa Milà (undergoing renovation), another is the Crypt in Colonia Güell, out in the hills way out in the west of Barcelona, and the last is the Casa Vicens – which I had intended to visit but completely slipped my mind. Certainly we will revisit Barcelona, and I will tick off the rest then. Back in Girona we had a reservation at the city’s second most renowned restaurant, Massana. I say second because Girona is home to what is arguably the hottest restaurant in the world right now, El Celler de Can Roca. The Celler however was fully booked for the next eleven months, so there was no chance of getting in there. 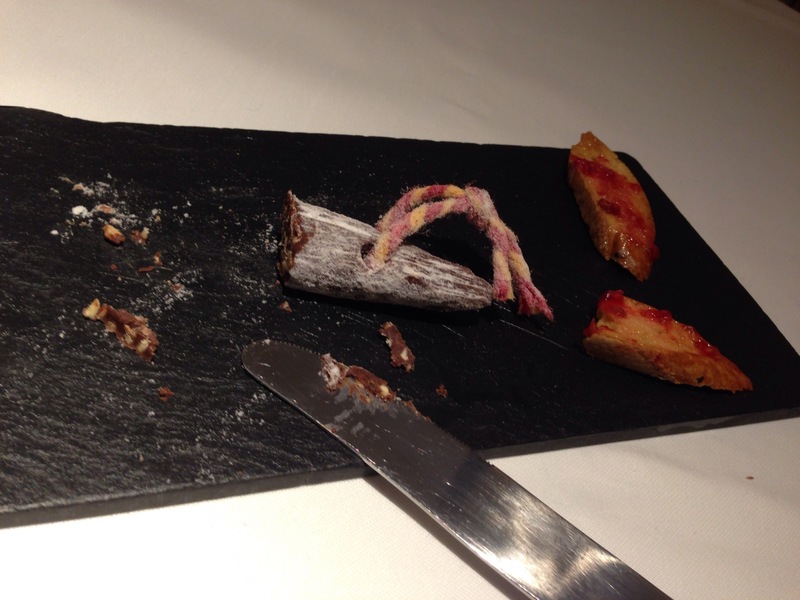 At Massana we went for the tasting menu, which was a first for both of us. The decor and service were pleasantly discrete, and the food was impeccable, all supervised by Mr Massana himself standing outside the kitchen doors. 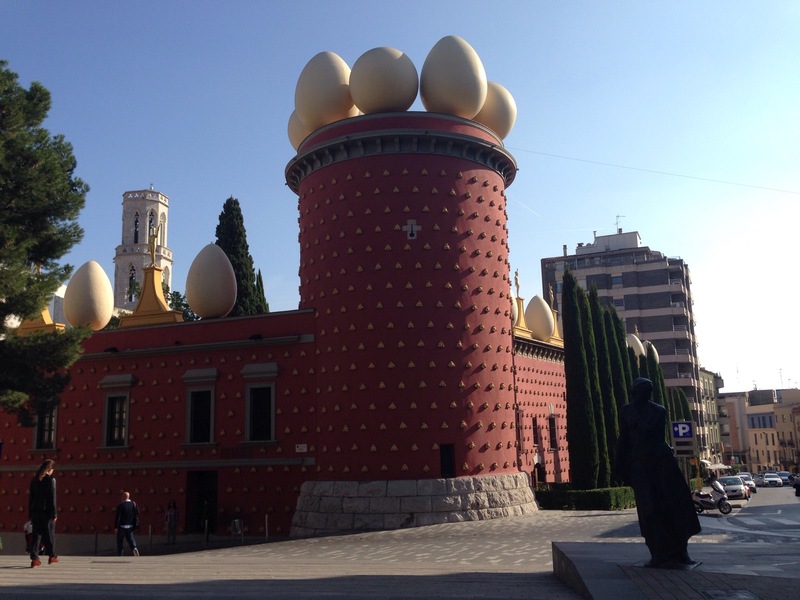 Plans for the Sunday before flying home centred on taking the train to Figueres in order to visit the Salvador Dalí “Theatre-Museum” in the great Surrealist’s hometown. Dalí himself designed the museum, so it is just the kind of wacky layout and design that you would expect from his paintings. 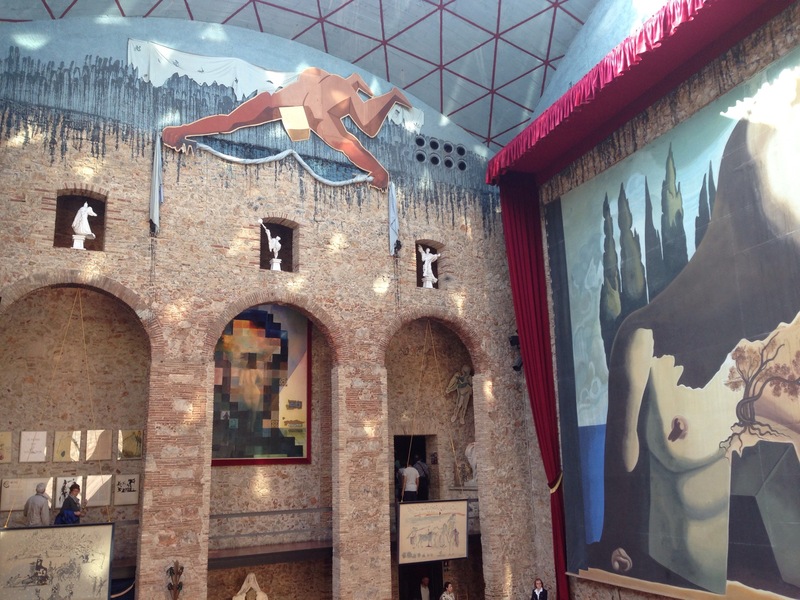 If you like the works of Dalí then this museum is a must. It houses a large proportion of his works (though I have been surprised to see just how many of them are in a museum in Florida). Of particular note is a velvet-lined room designed to feel like being inside a jewelry box, in which Dalí has hung some of the paintings that were most important to him. Several of them are unsurprisingly of Gala, his wife (and the muse of several prominent artists before him), to whom he was so devoted. 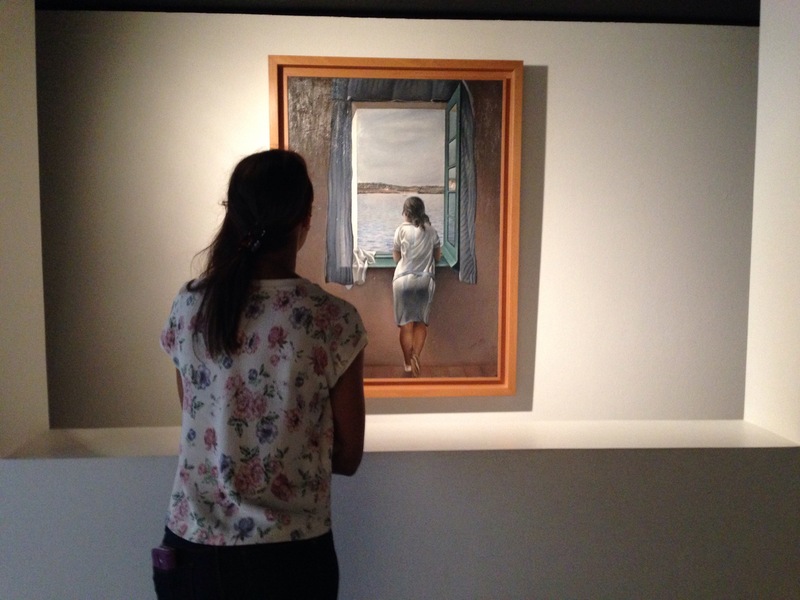 In the picture of above you can see one of my favourite Dalí works, the amusingly entitled Gala Contemplating the Mediterranean Sea which at Twenty Metres Becomes the Portrait of Abraham Lincoln. Given that this photo was taken from about twenty metres away, all you can see is a pixelated picture of Abraham Lincoln – however, up close you can clearly see the figure of Gala at a window. In fact it is only on looking at it now that I notice just how invisible the Gala figure is. Take a look at a closer photo here and you’ll see what I mean. Although known primarily as a Surrealist (“The only difference between me and the Surrealists is that I am a Surrealist”), Dalí, like most artists, also experimented with more conventional styles in his early phases. Other works I enjoyed seeing here were ‘Leda Atomica’, ‘The Poetry of America – The Cosmic Athletes’ (first appearance of a Coca-Cola bottle in art, 20 years before Warhol) and the Arnolfini-esque ‘Dalí from the Back, Painting Gala from the Back, Eternalised by Six Virtual Corneas Provisionally Reflected in Six Real Mirrors’. Four months later we returned to Barcelona, principally to visit the Palau de la Música Catalana and Hospital de Sant Pau, but we also took the opportunity to tick off two more of the seven sub-components of this Gaudí WHS (the only part we didn’t manage to see on either visit is the Crypt at Colonia Güell, which was both miles outside the city and closed on the day of this visit). 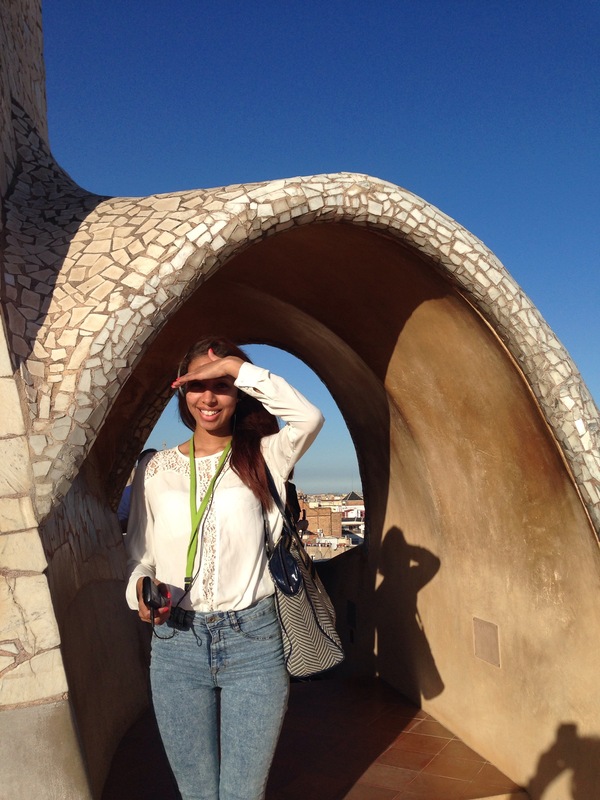 Arriving at El Prat Airport around 4pm, we headed straight to the Casa Mila – which stays open until 8. On our previous visit, this major Gaudí building had been entombed in scaffolding, but to our surprise the scaffolding had since then been disassembled. 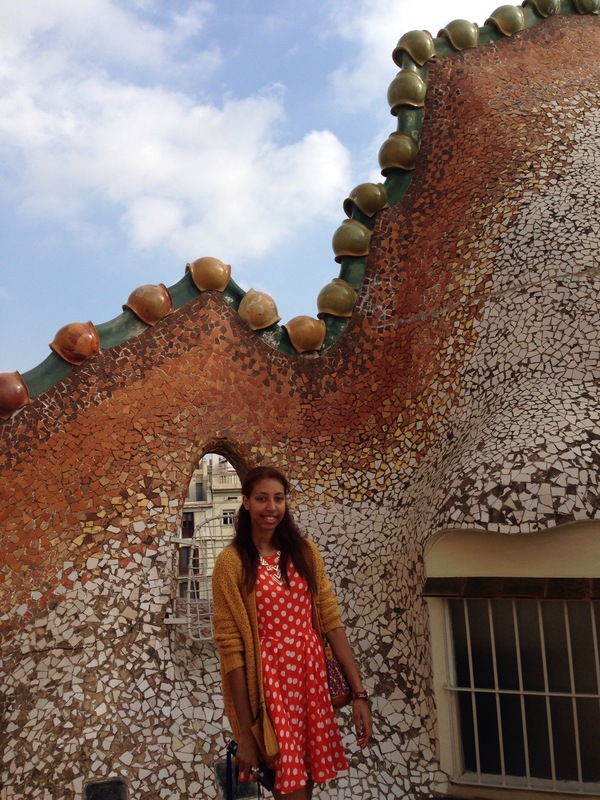 At €21 each it is the most expensive of the Gaudí sites, but we bit the bullet and went in there. It turned out to have been worth it because it wasn’t crowded and was very pleasant to spend time on the roof in the evening sun. Like other Gaudí buildings, Casa Mila – also known as La Pedrera – is topped with ornate chimneys, conveying the architect’s philosophy that functional items should be made decorative too. Interestingly, this is still an inhabited building, with ordinary people living in apartments overlooking a central courtyard full of tourists like us. As well as the roof and the courtyard, visitors are allowed to wander round the attic floor and the floor beneath that, which is full of period furniture as it was when the building was new. 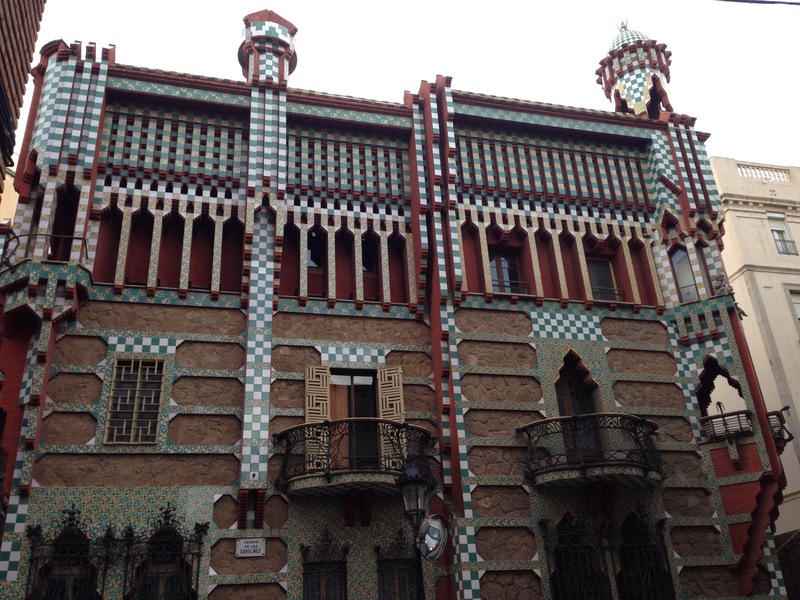 After La Pedrera there was just enough daylight left (on the last day before the clocks changed) to see the Casa Vicens. This is a fully private residence, so you have to settle with viewing it from outside in the street. It was one of Gaudí’s earliest buildings in Barcelona – a project that helped him to make a name for himself in the Modernisme movement. 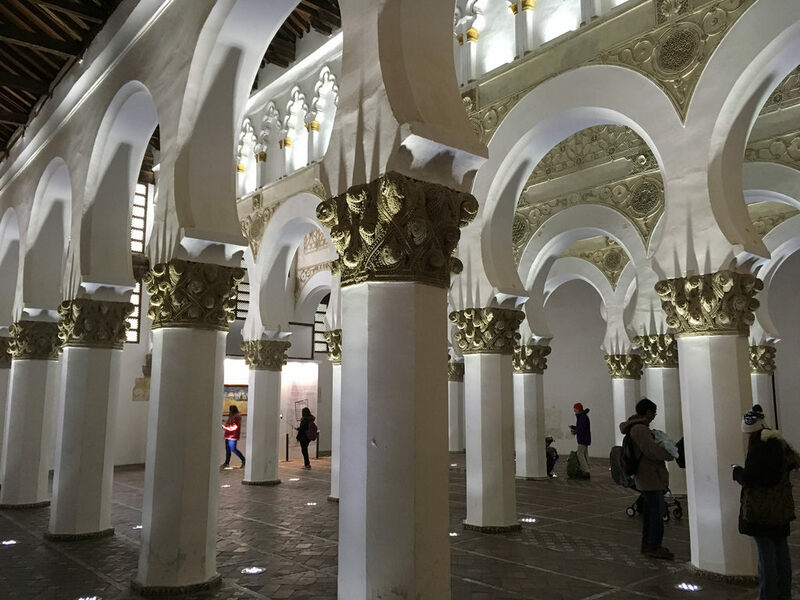 The house clearly shows the influence of Moorish architecture, a collective memory that has affected Spain in a way that could hardly be imagined in other European countries. This entry was posted in 2014, 2015, Spain and tagged europe, natalie, Spain, Tom on 7 November, 2014 by Tom Livesey. 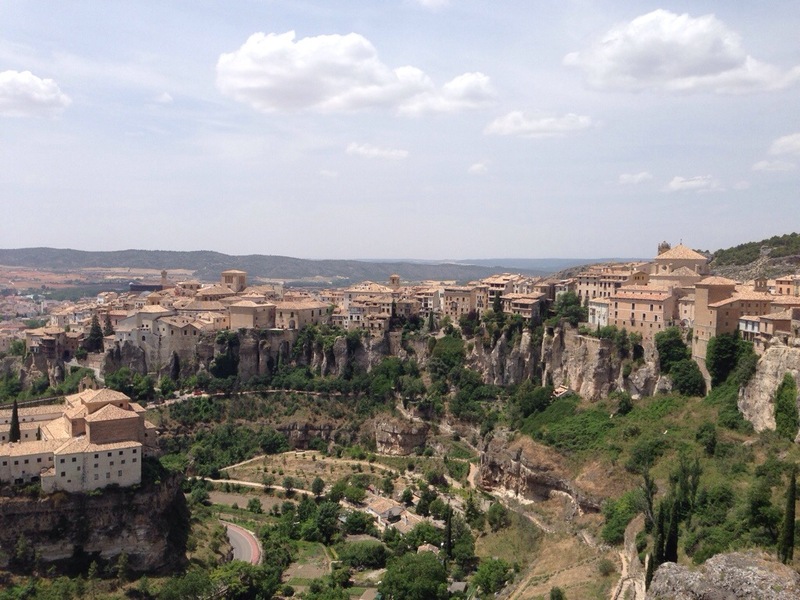 Somewhere between Valencia and Madrid in the region of Castile-La Mancha lies Cuenca – a little-known but fantastically situated clifftop town steeped in history. 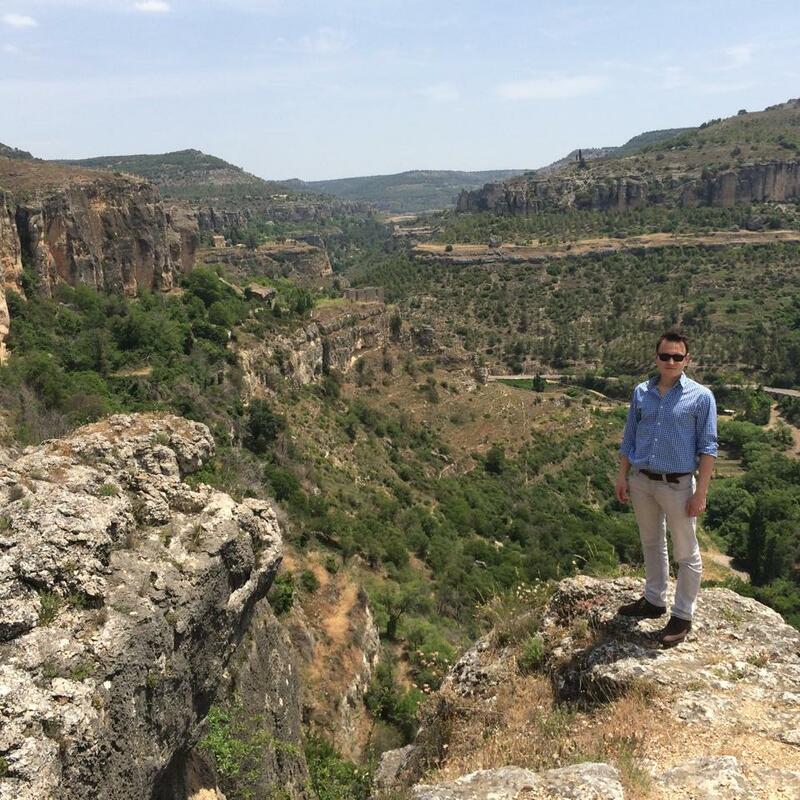 Originally built up by the Arab Moors, from 714, it presented a strategically dominant location, sandwiched on high ground between the gorges of the Júcar and Huécar rivers. After falling under the control of the warring religions several times, it was recaptured for good by the Christians in 1177. Louise, Ross and I arrived by train from Valencia, which took only an hour or so. The station we came into – Fernando Zóbel – is several kilometres outside of town, which caused Louise some consternation as she wondered what we were doing alighting in the middle of the countryside! Cuenca is the sixth most populous town in Castile-La Mancha, and I believe most of its 56,000 people live in the new town, as opposed to the old town up on the cliffs. The new town sprawls around the base of the hills, and isn’t exactly what tourists come expecting to see. We discovered we had accidentally booked ourselves a hotel in the new town, giving us a fairly long and steep hike up to the old town for the two days we were there. Not to worry though, as walking up the hill proved to be well worth it, putting us in a town that time forgot. 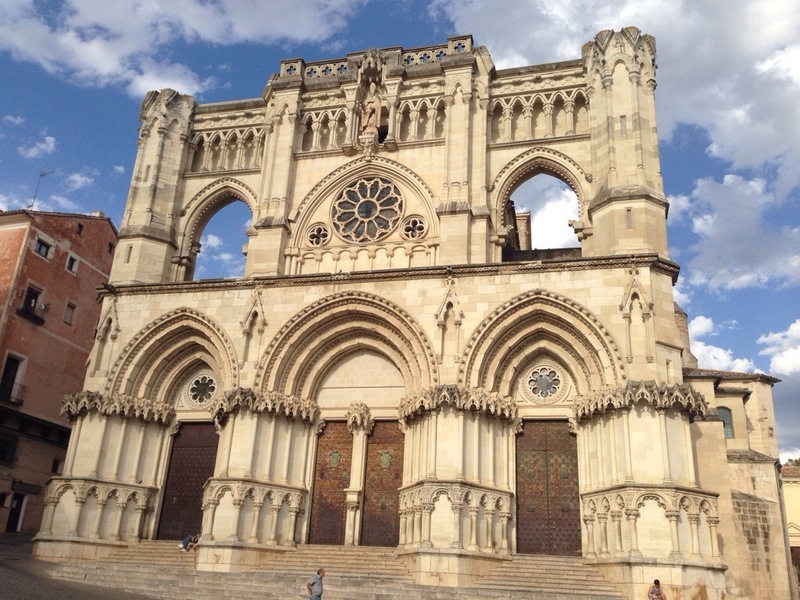 Cuenca’s centrepiece is its cathedral, built 1182-1270, which was the first Gothic cathedral in Spain. We went inside for the audio guide tour (€3.80), and Ross & Louise insisted on listening to every one of the 37 stops. It was actually quite interesting to hear about the interior in such granularity, and to find out what the various pieces of iconography actually stood for. 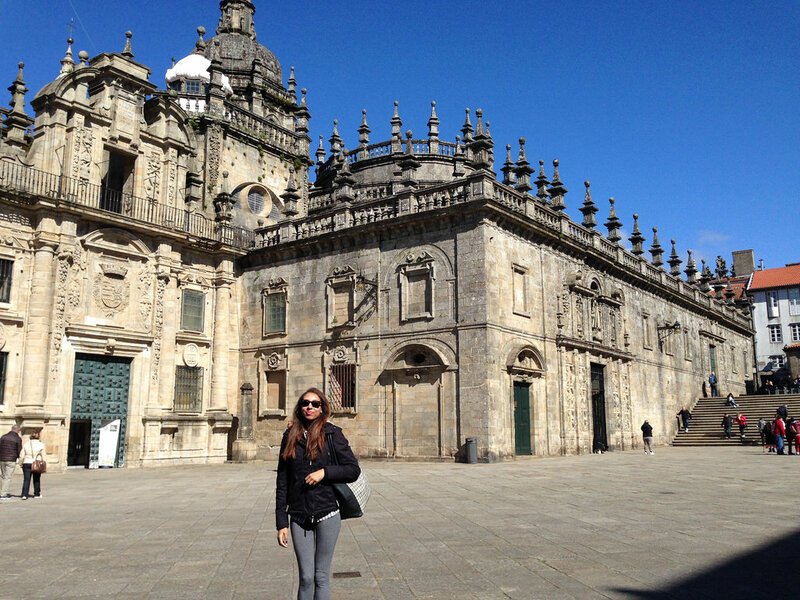 The cathedral fronts onto the town’s main square, Plaza Mayor (which just means “big plaza”, according to Louise). There are several cafe/restaurants on the plaza, and it was at here, at Restaurante San Juan, that we ate at on our first night. The meal was very heavy on the meat, which we didn’t really mind. 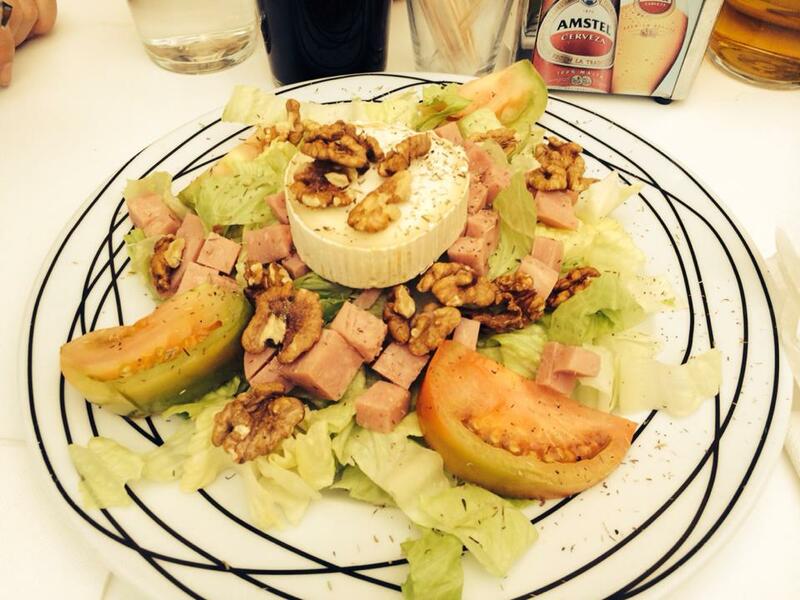 This local salad consists of goat’s cheese, ham, walnuts, green tomatoes, onions and salad leaves. The next day, instead of ascending the hill again, we decided to take the bus up. When a number 2 arrived we jumped on, but realised we were heading in the wrong direction. So, for only the cost of two bus journeys (the driver made us pay again on the return), we got to see a part of Cuenca most tourists never see … its industrial outskirts! An hour or so later we were at the top of the hill where we wanted to be – in the old town. It was about midday, the sun was beating down and the views were amazing. Exploring the rocky outcrops, it felt like the wild west. More Mexico than Spain. 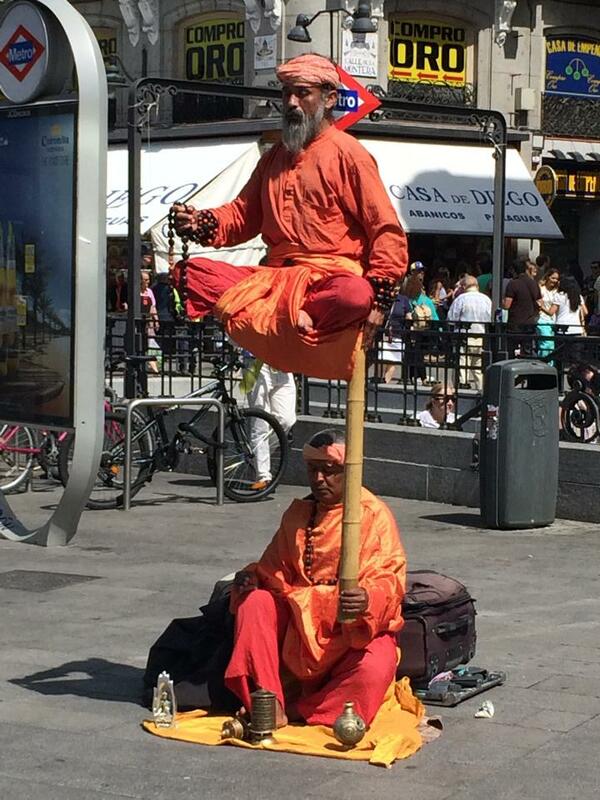 There weren’t really any safety barriers, so you were pretty much free to walk around and fall off as you pleased. I like that freedom to take your own risks. We stopped for lunch up here, in what was probably the best cafe we visited. As well as having a great view of Cuenca (as in the picture at the top of this post), it served up some excellent bar snacks and lunch. 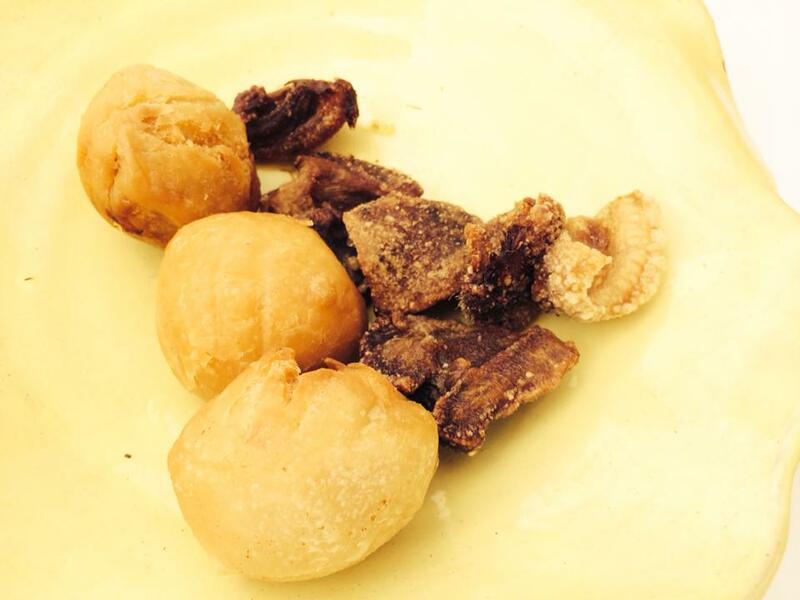 The pork scratchings were quite familiar to us as Brits, though they were warm and less brittle than those you get at home, and the dough ball contain pieces of chorizo. After lunch we walked into town. 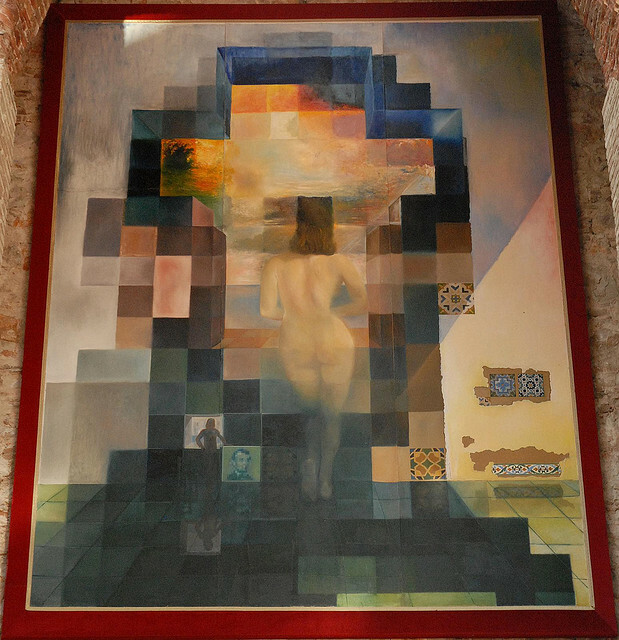 It is not only medieval sights to see in Cuenca – you should also check out the Museum of Spanish Abstract Art. The station we had arrived into was named after the Spanish-Filipino painter Fernando Zóbel, who was inspired to paint many of his abstract landscapes by the countryside surrounding Cuenca. 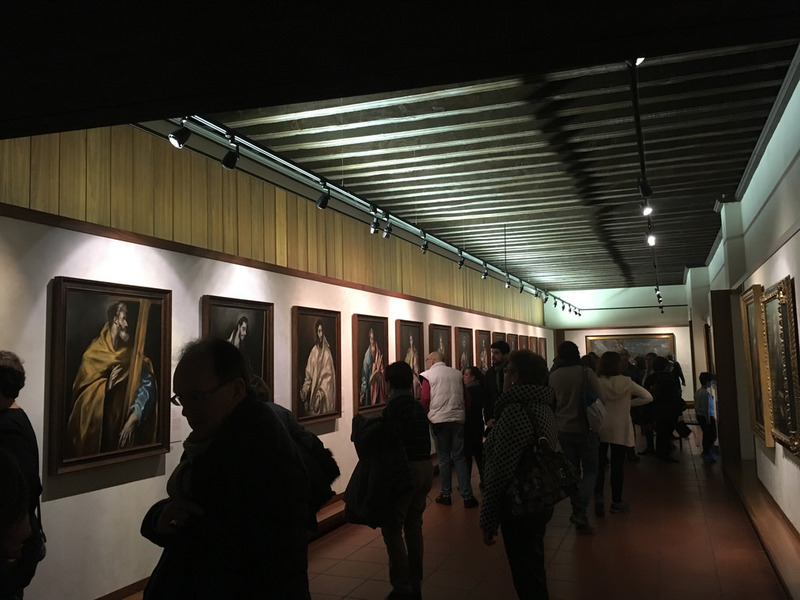 There are plenty of other artists exhibited in the museum, and the setting seems perfect. Somebody there has had the good idea of putting in windows in the style of picture frames, with the intention being to showcase nature’s beauty as a piece of art. Cuenca has other museums – I briefly visited the Cuenca Museum, which is dedicated to the history of the area. It didn’t really work for me, though, as the displays are solely in Spanish. I was surprised that there didn’t seem to be any coverage of the Christian-Muslim battles for control of the town, as that strikes me as surely the most interesting period of its history. 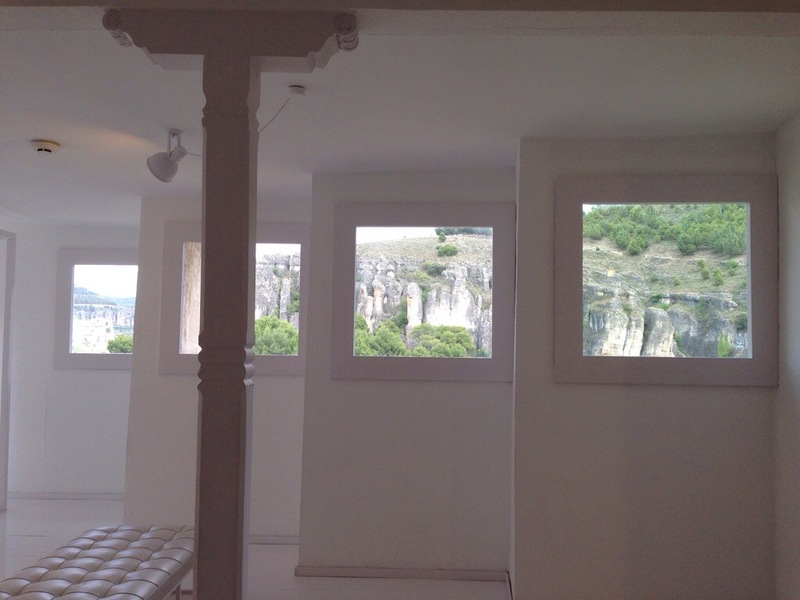 The museums are built either within or close to some of the famous hanging houses of Cuenca. These are buildings with balconies that jut out over the cliff edge, as you can see behind us in this photo. The bridge you can also see in it leads across the valley to a still-working monastery. Well, after a very pleasant time in Cuenca, the next morning we had a train booked for Madrid, just an hour’s journey away. One of the most pleasant feelings I know is “not being hungover”, and I managed to experience this on every day of the trip. It probably had something to do with the small servings of beer you get in Spain – very civilised. 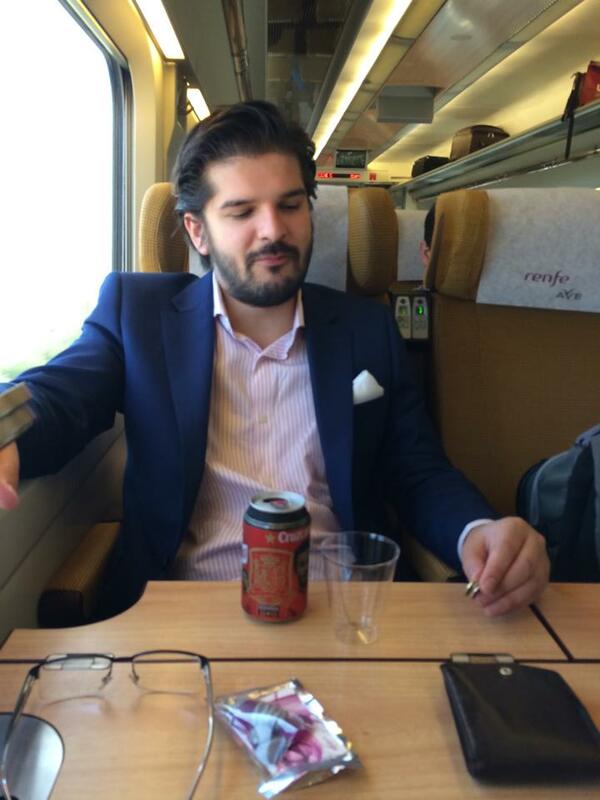 Consequently, we were able to do things like enjoy a beer pre-9am on the train to Madrid. Now, having a beer on a train on holiday is pretty much obligatory, but the novelty was actually enjoying it! I only spent the one day in Madrid, as I had a flight booked home that evening. Since we were getting there early, though, there was time for a lunch and a visit to the Reina Sofia (home of Picasso’s epic Guernica and various works by Dalí). Highlights from my day included a very comfortable outdoor bar round the back of the Royal Palace and Ross being told to “shh” by this man for giving away his secret! This entry was posted in 2014, Spain and tagged europe, Louise, Ross, Spain, Tom on 18 June, 2014 by Tom Livesey.